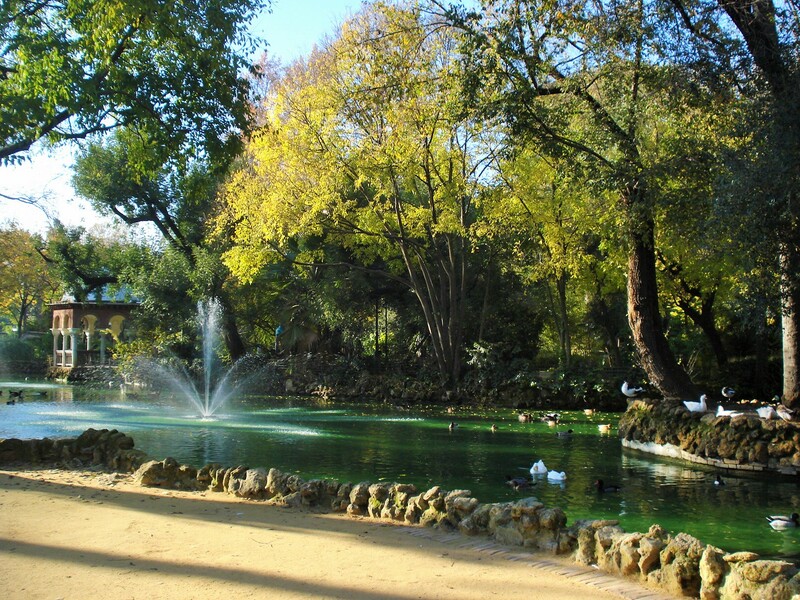 This park being such an expansive and complex creation, I am featuring it through several posts.This one showcases the Fountain of the Frogs (34 on map) and the Island of the Birds (6, Island of the Ducks on the map). 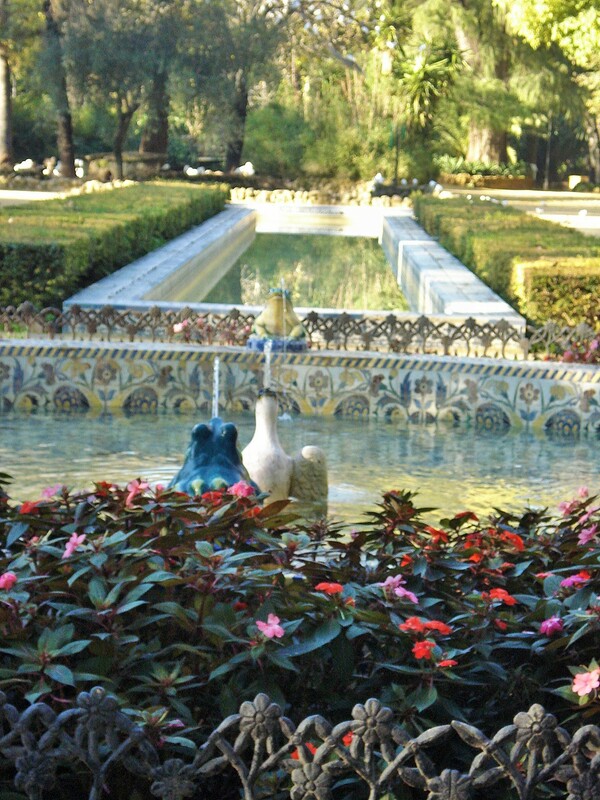 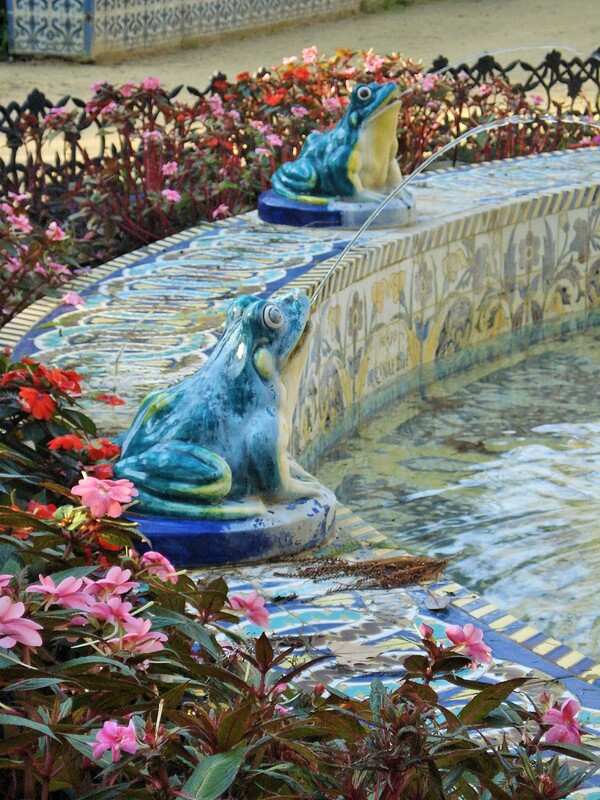 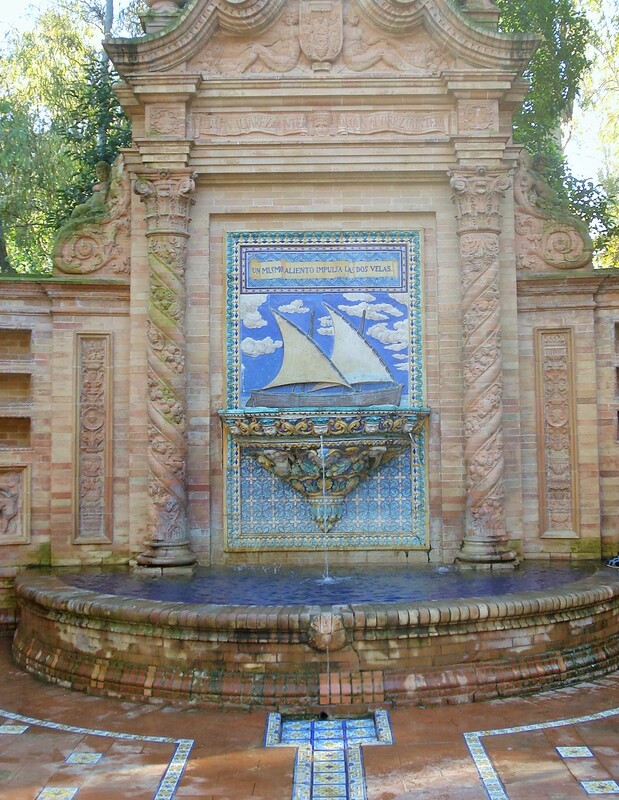 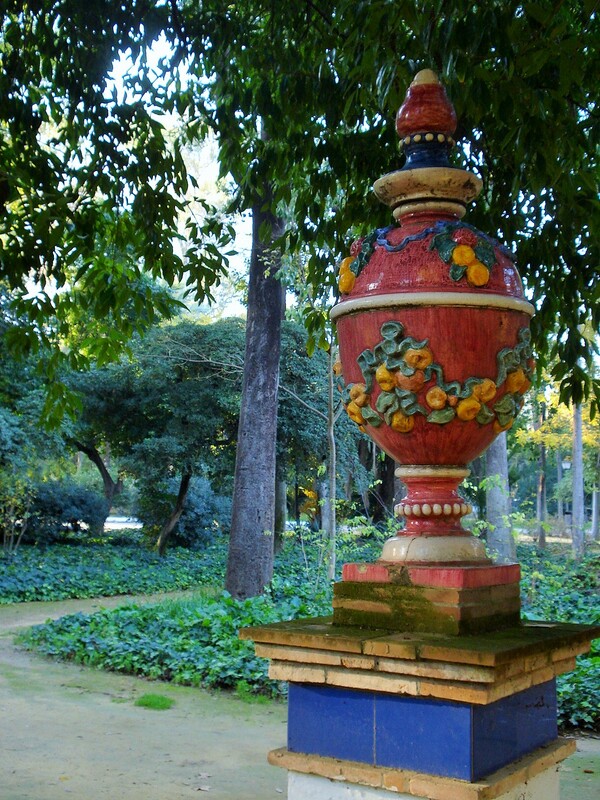 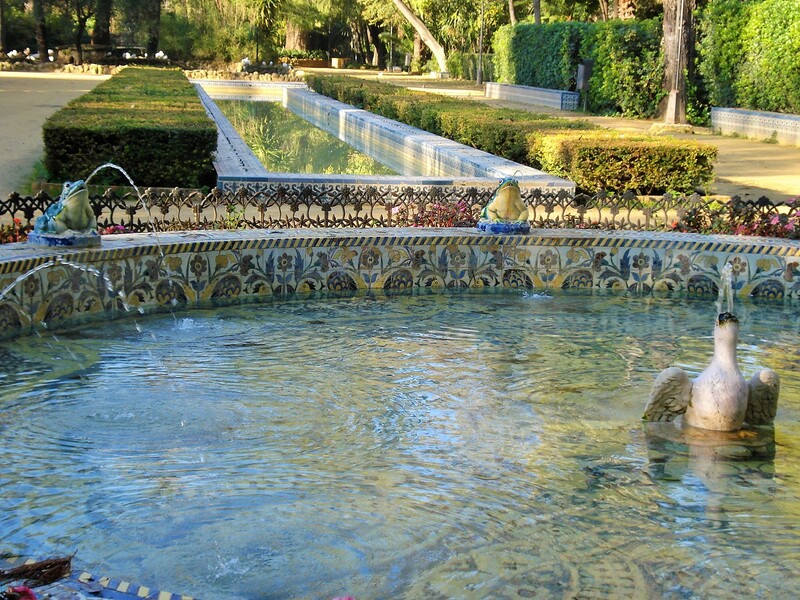 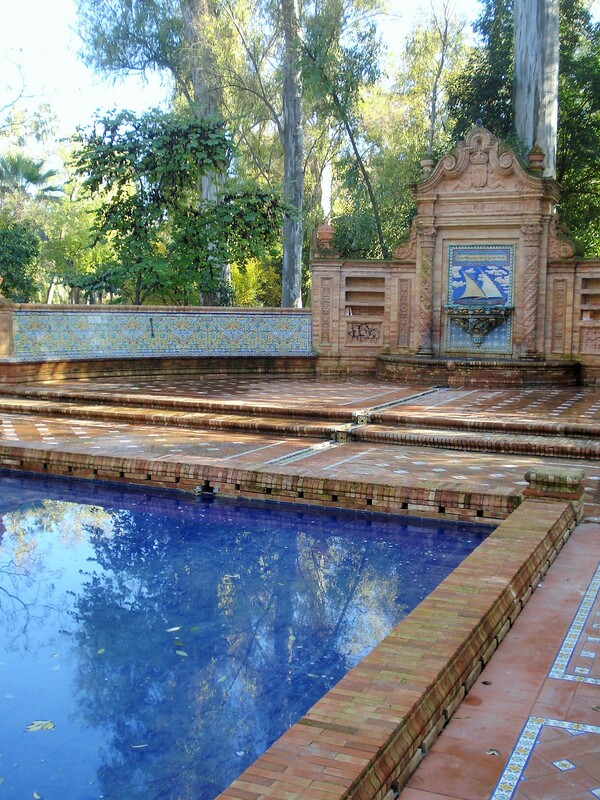 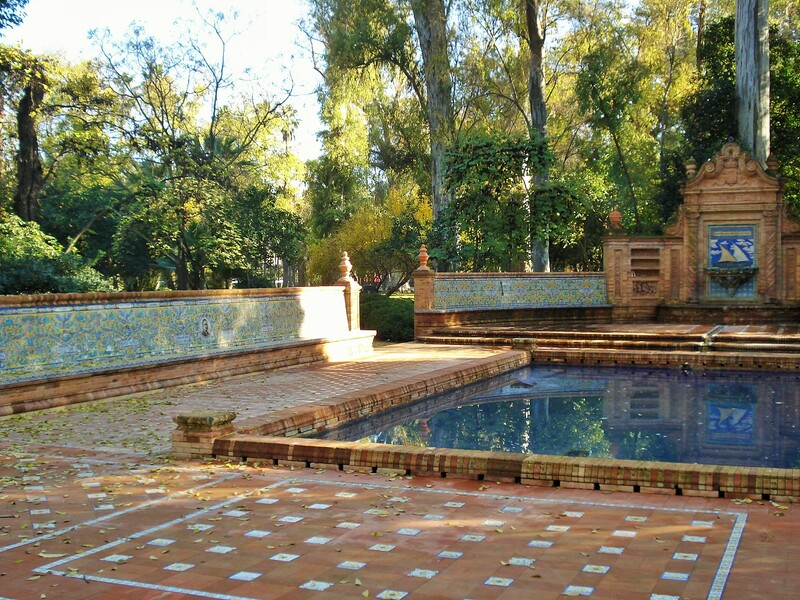 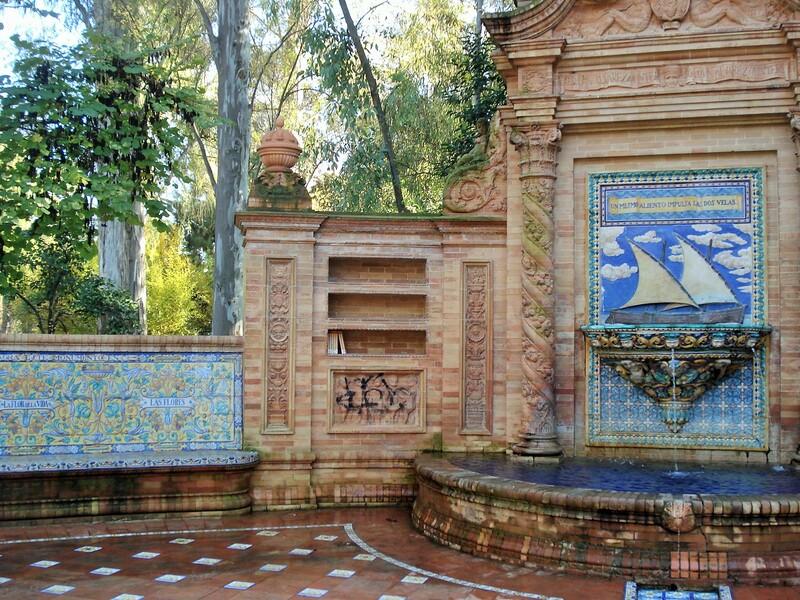 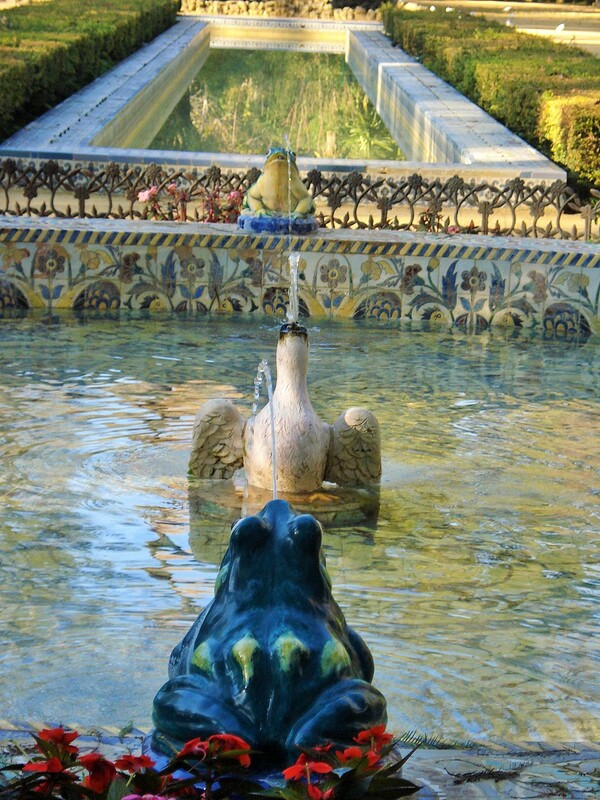 The whimsical Fountain of the Frog has colorful Andalusian ceramic frogs surroundinga fountain, followed by a pond that leads the Garden of the Lions to the Isleta de los Patos, or Birds Island. 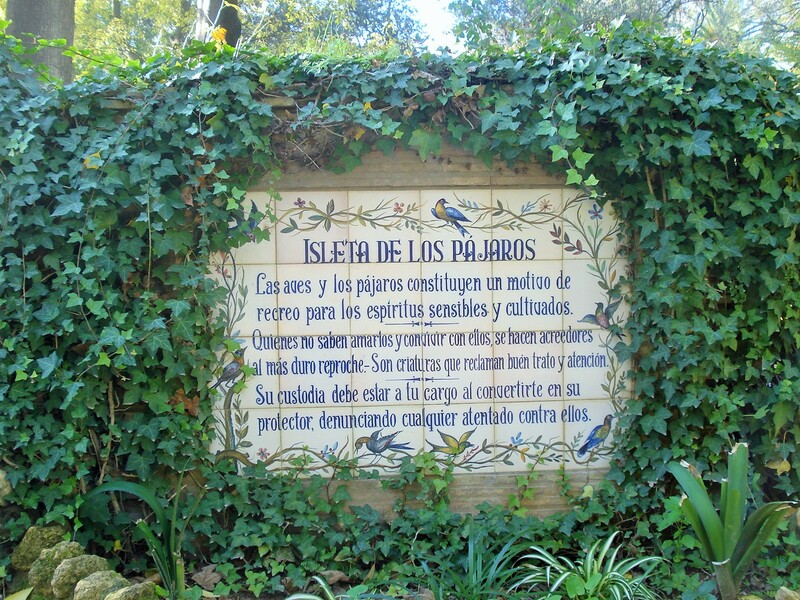 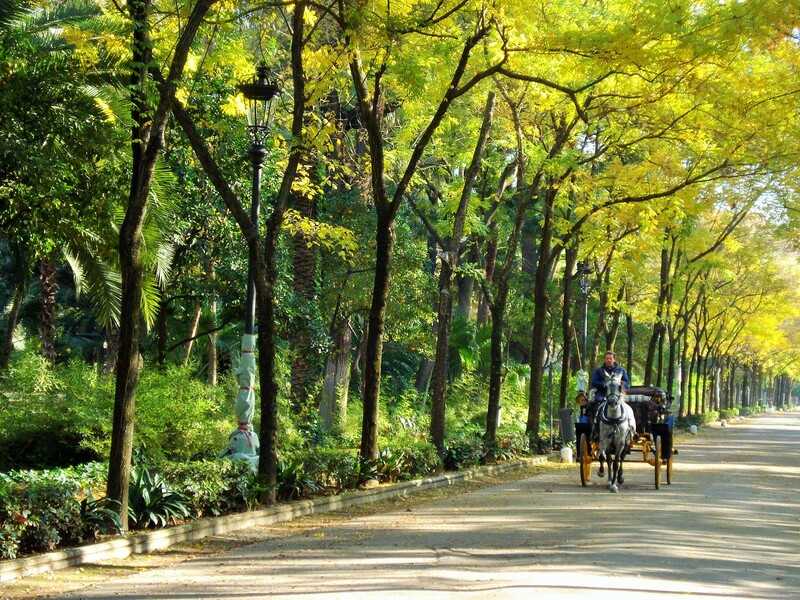 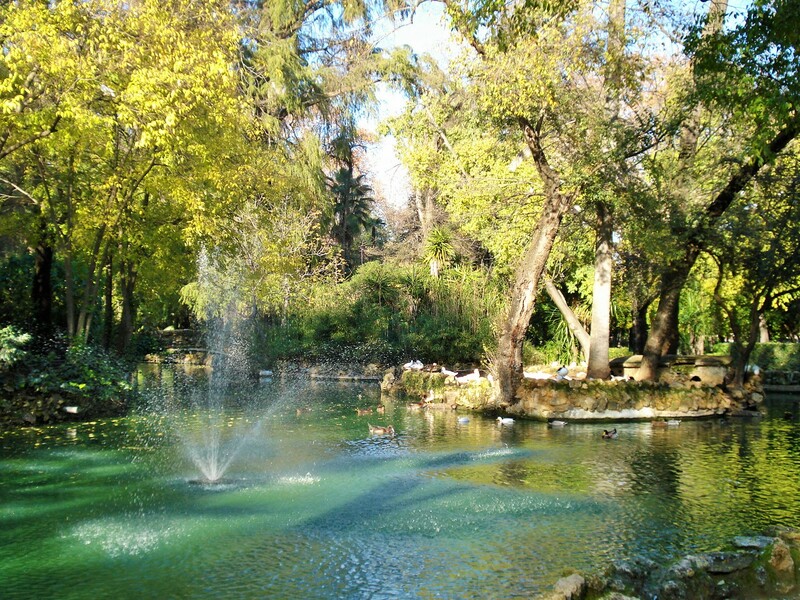 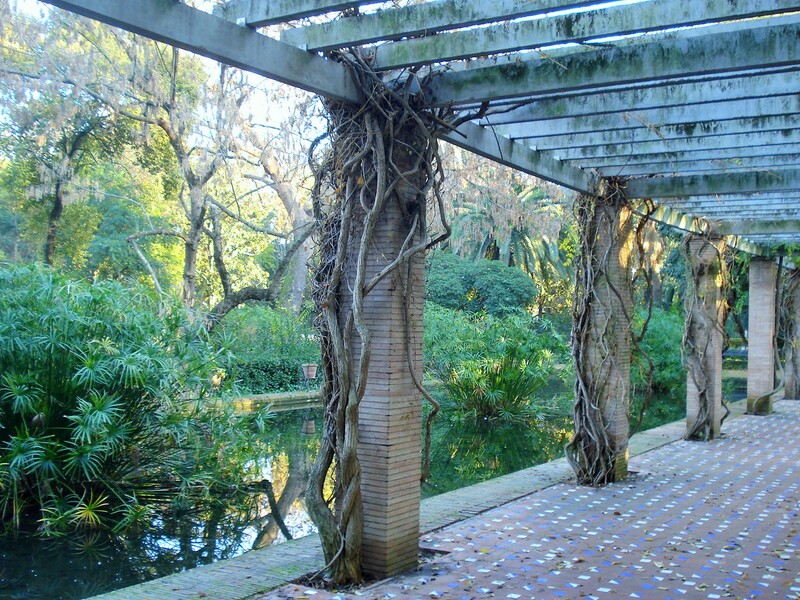 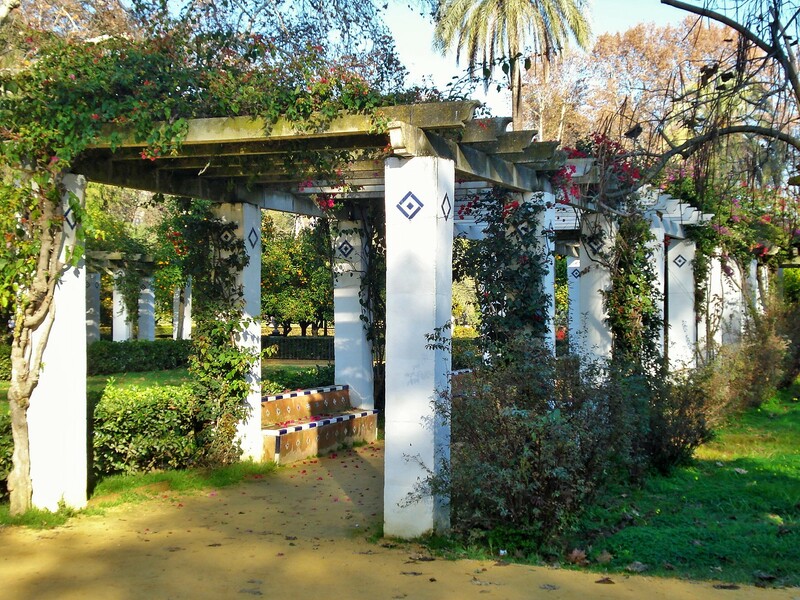 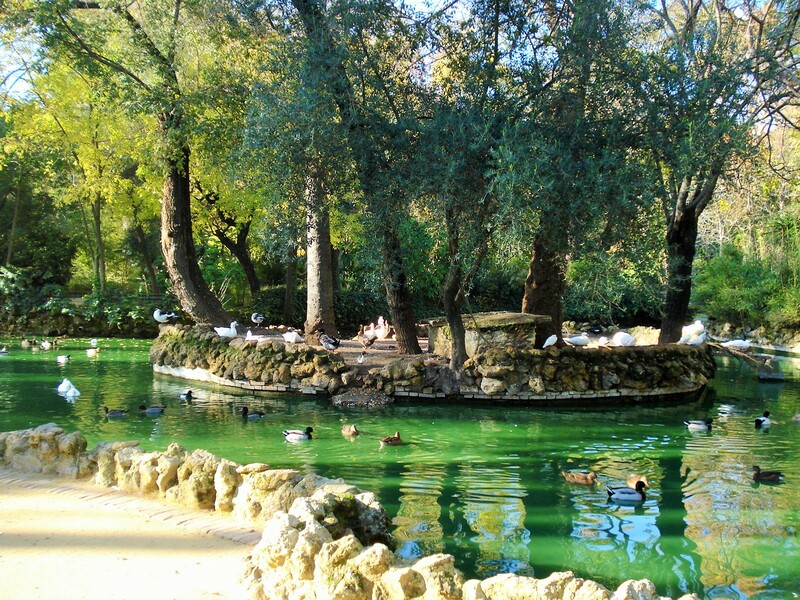 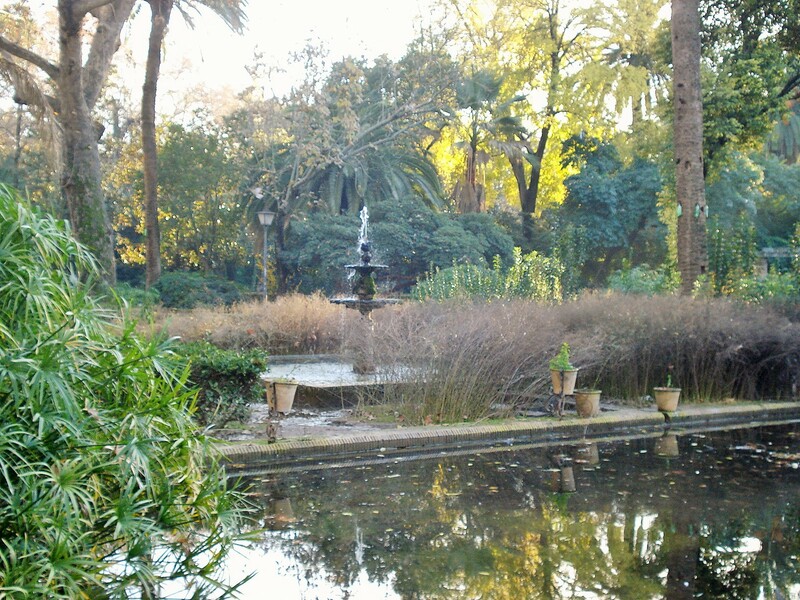 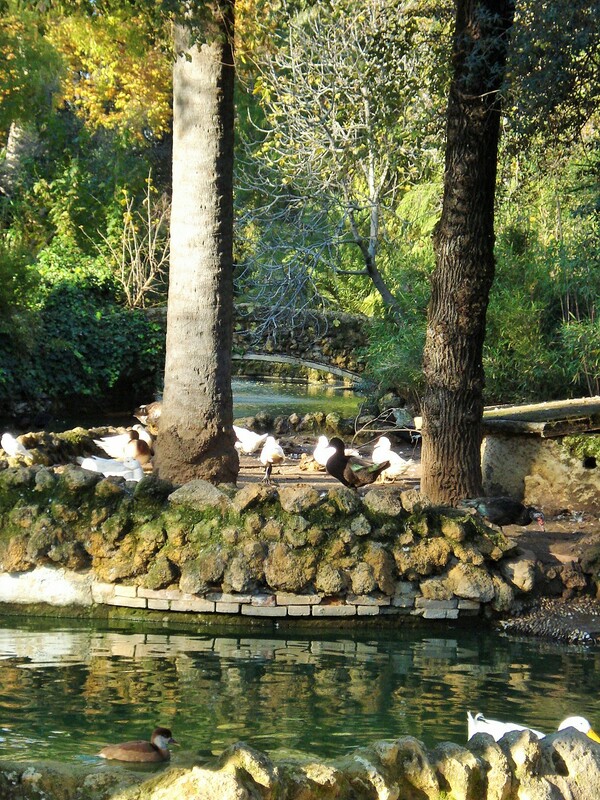 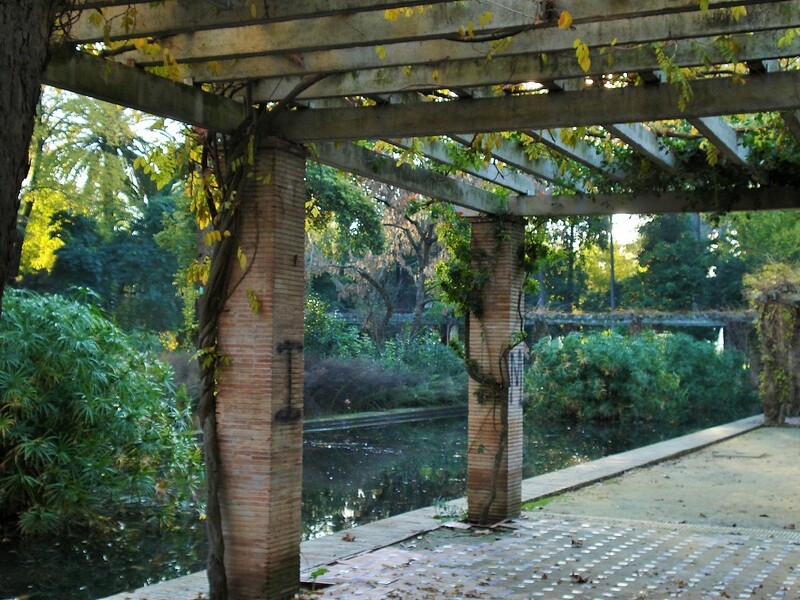 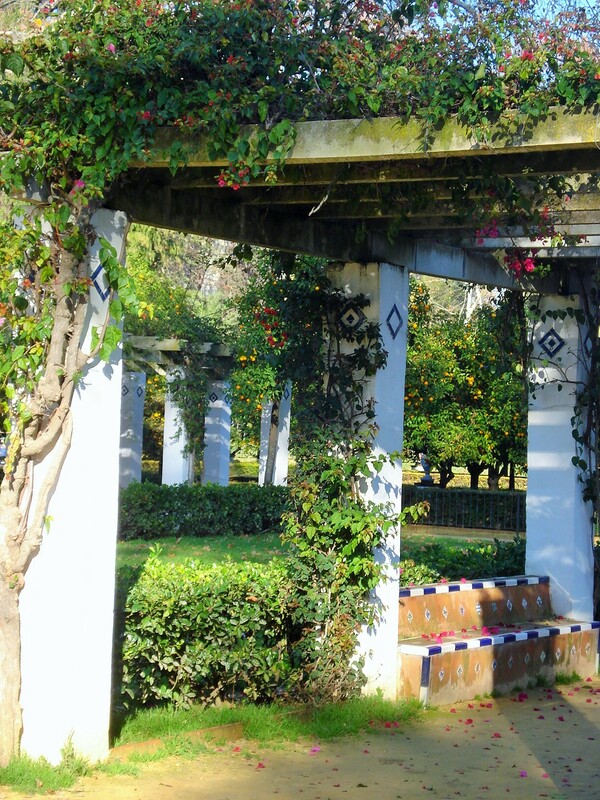 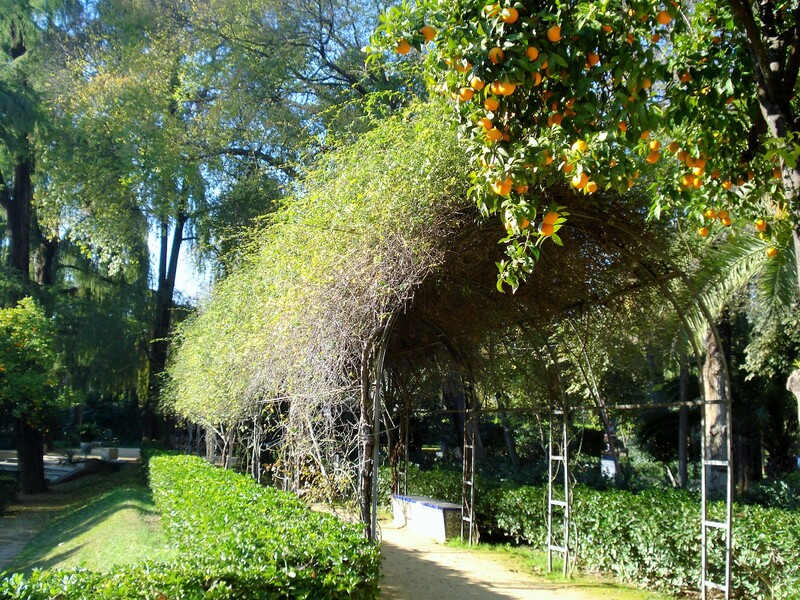 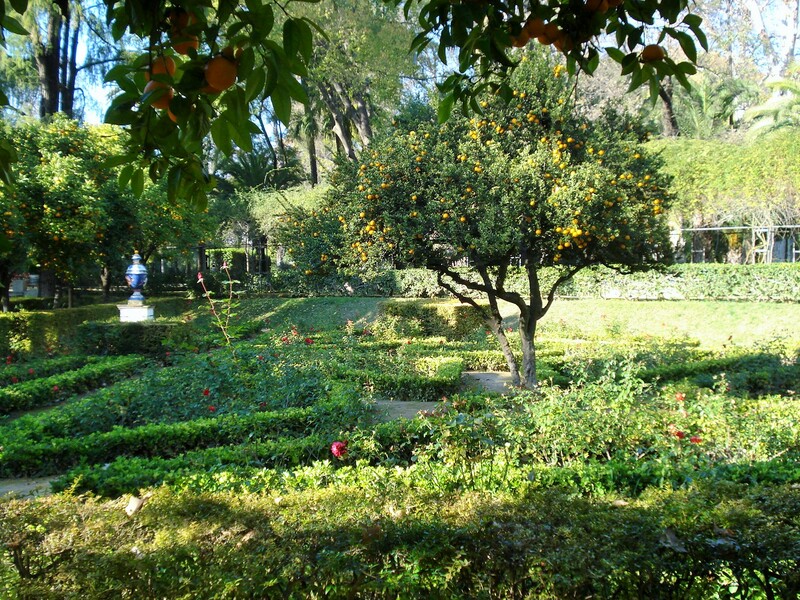 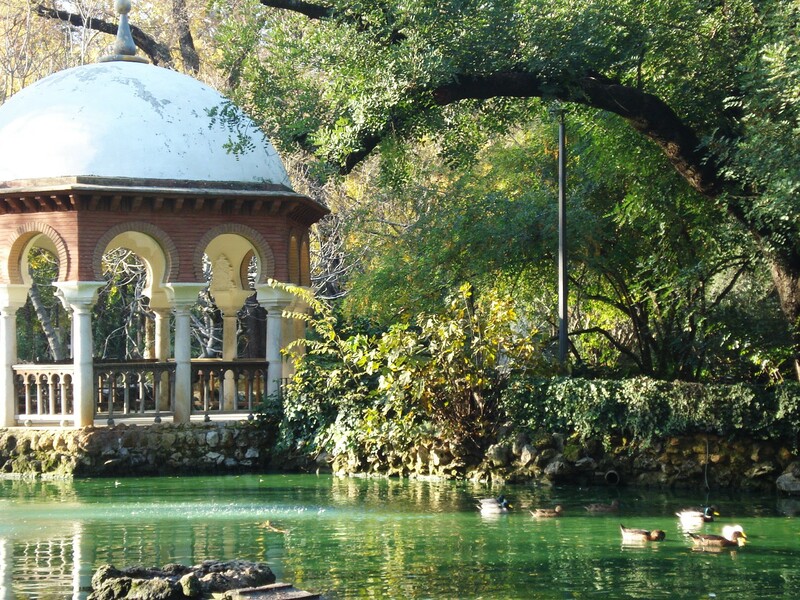 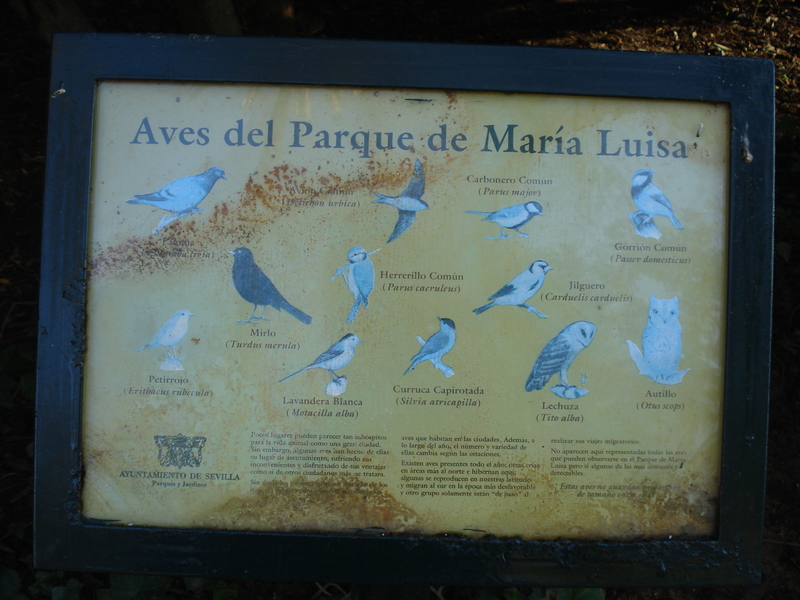 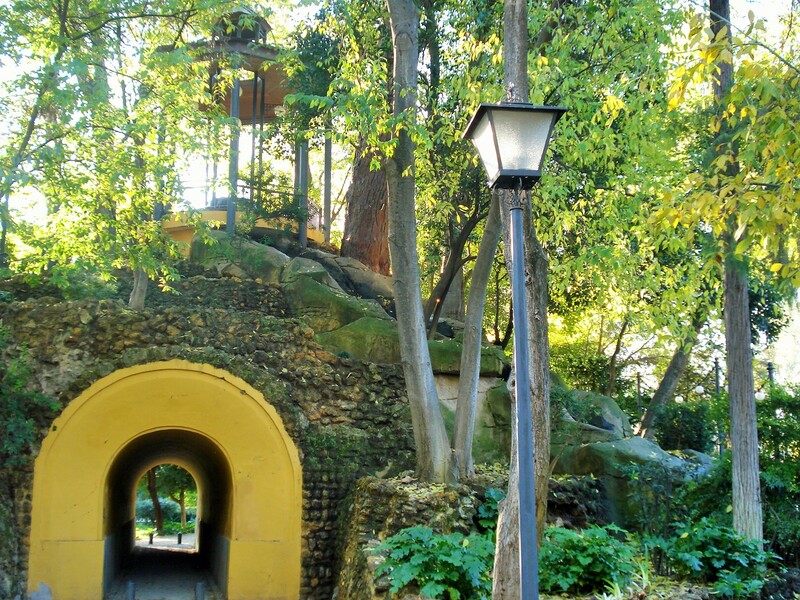 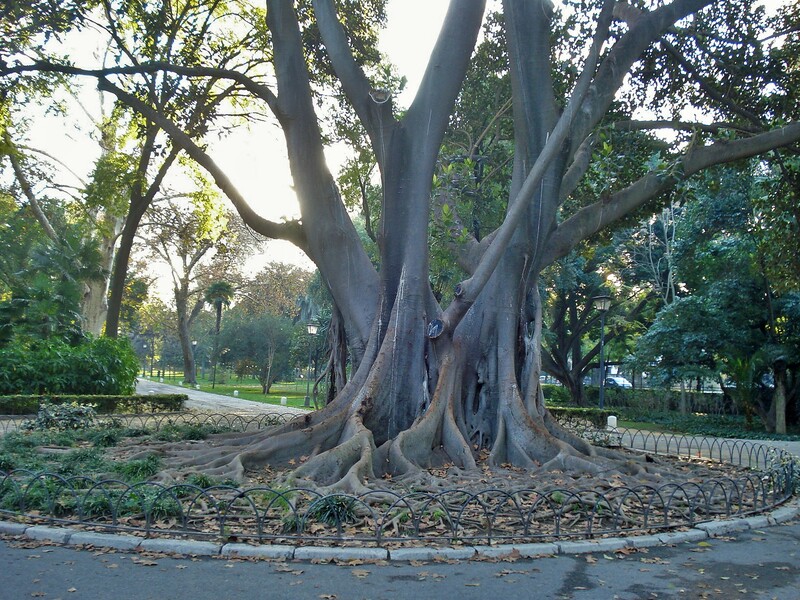 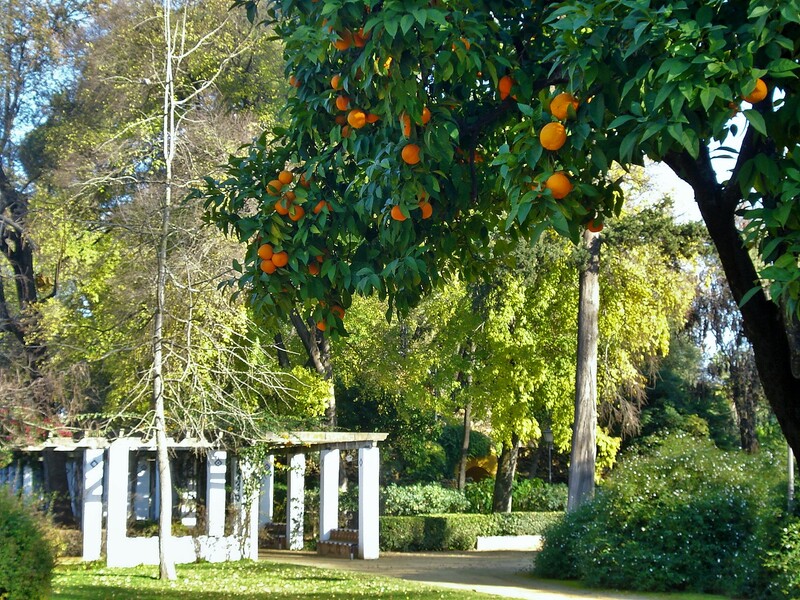 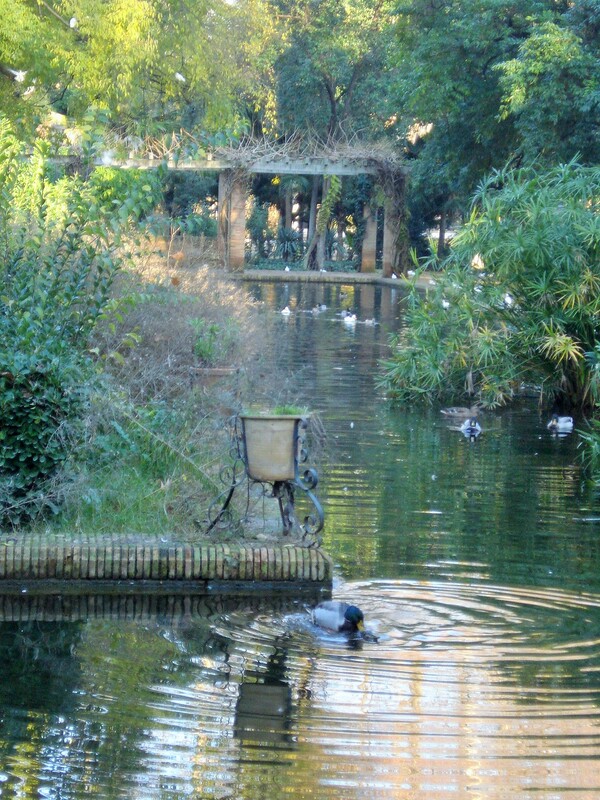 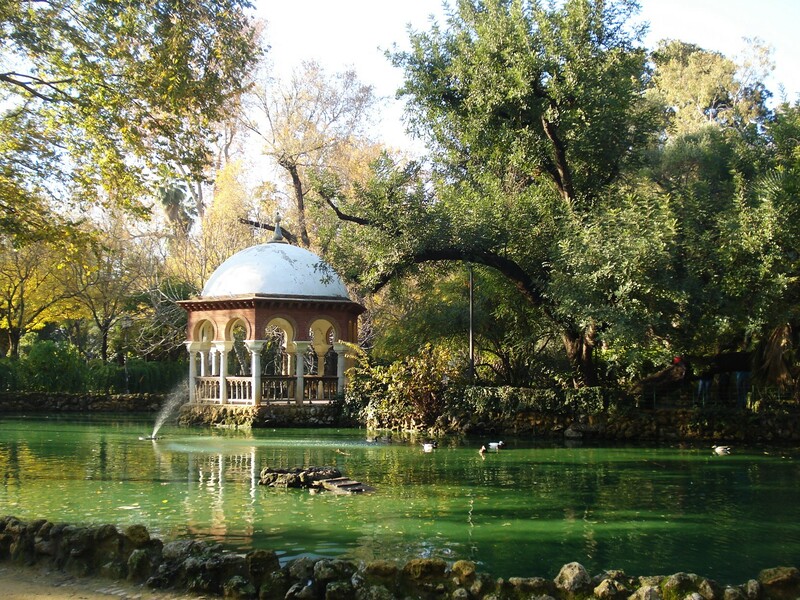 The island provides a sanctuary for the many birds inhabiting the park; its focal point is the Pavilion of King Alfonso XII, which dates back to the time it was part of the San Telmo Palace. 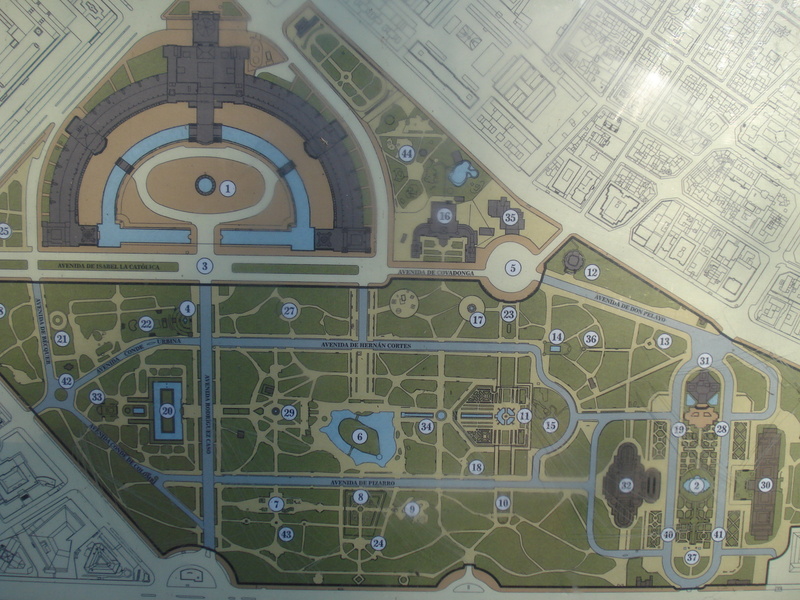 This park being such an expansive and complex creation, I am featuring it through several posts.This first one showcases the northern section of the park. 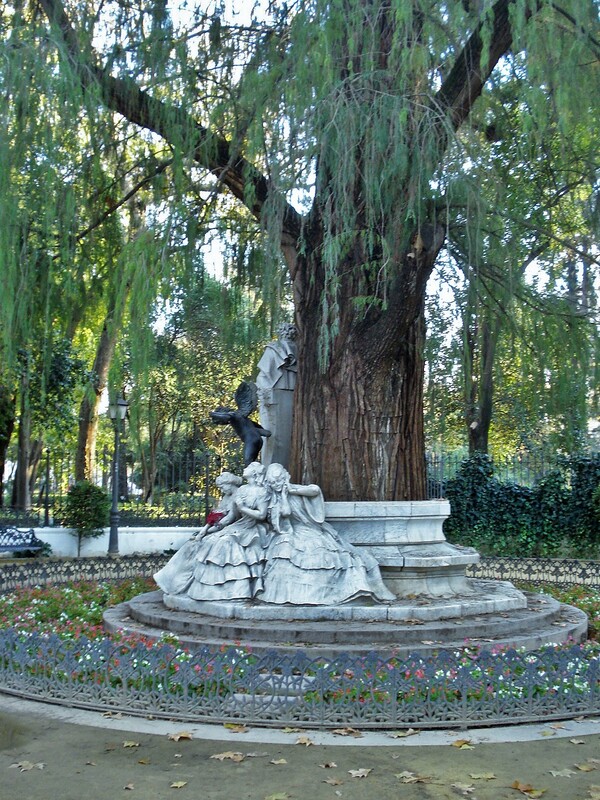 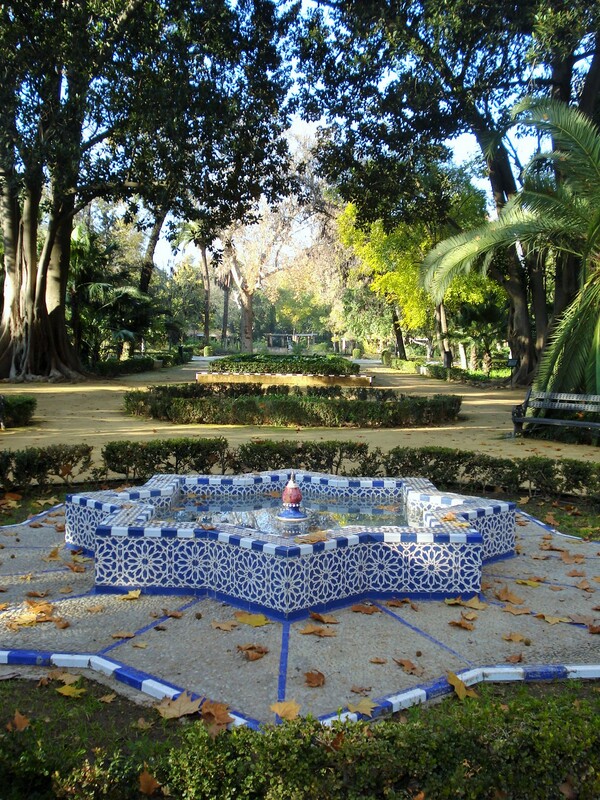 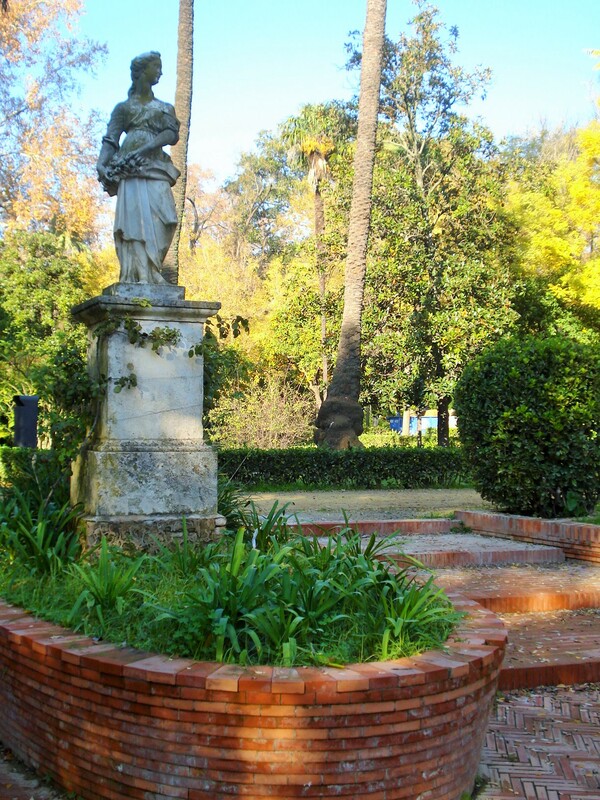 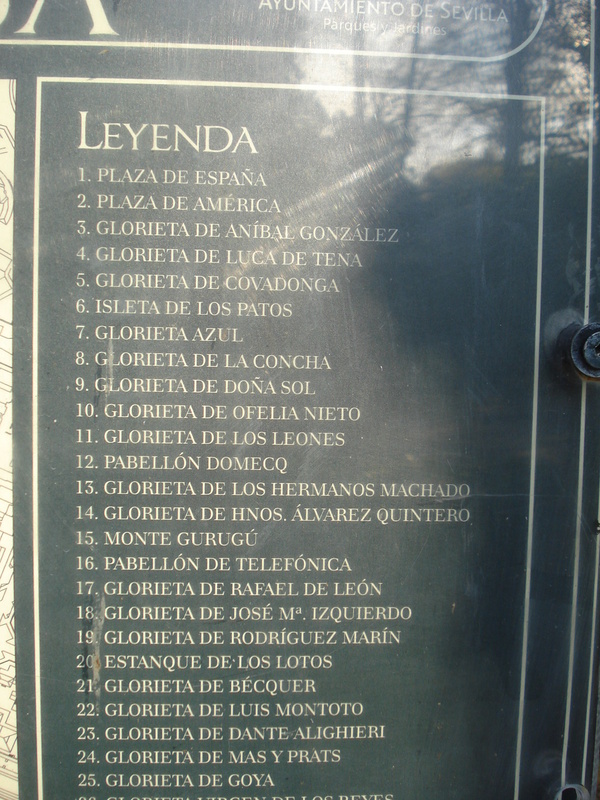 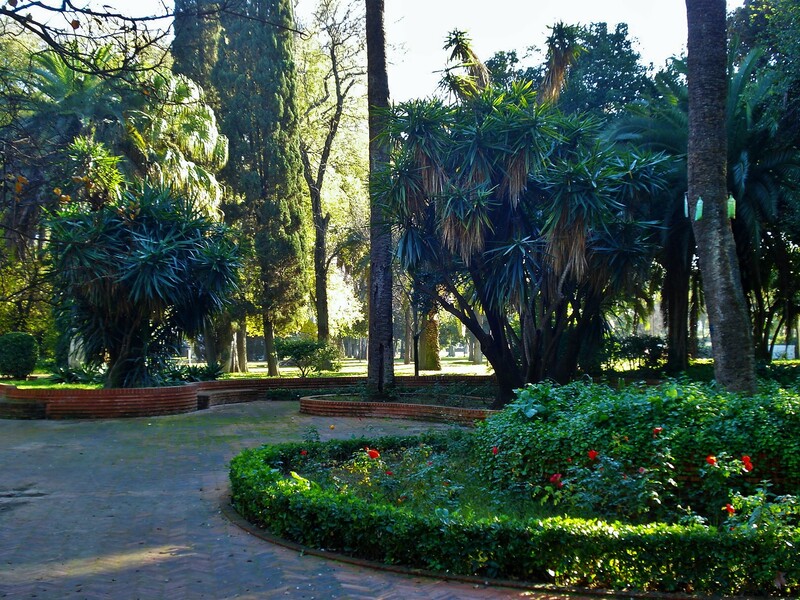 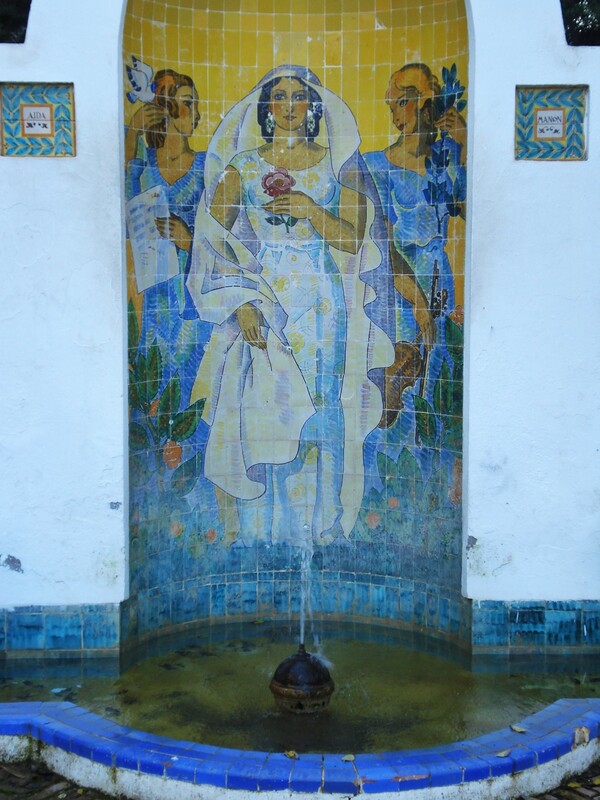 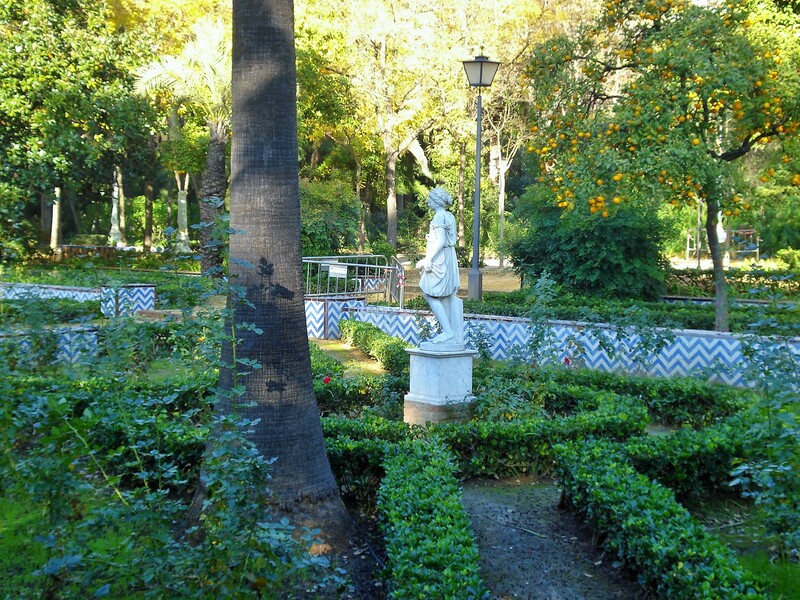 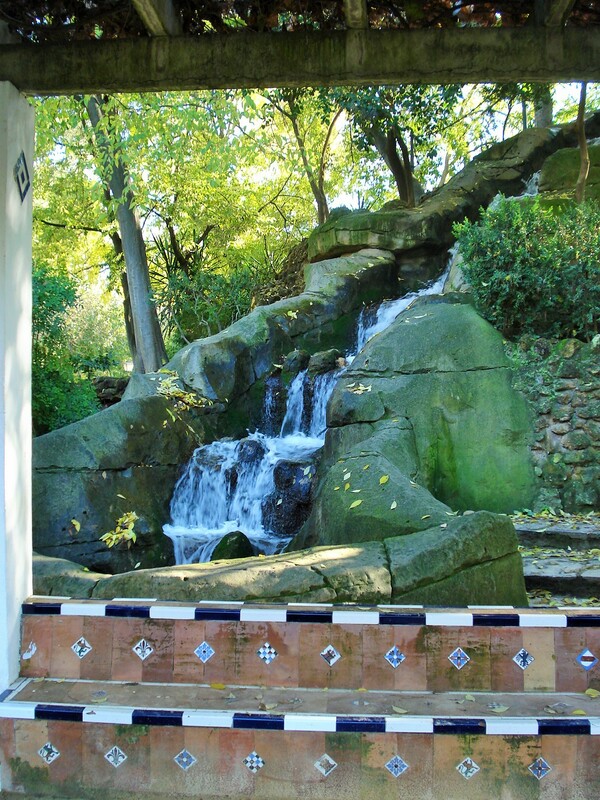 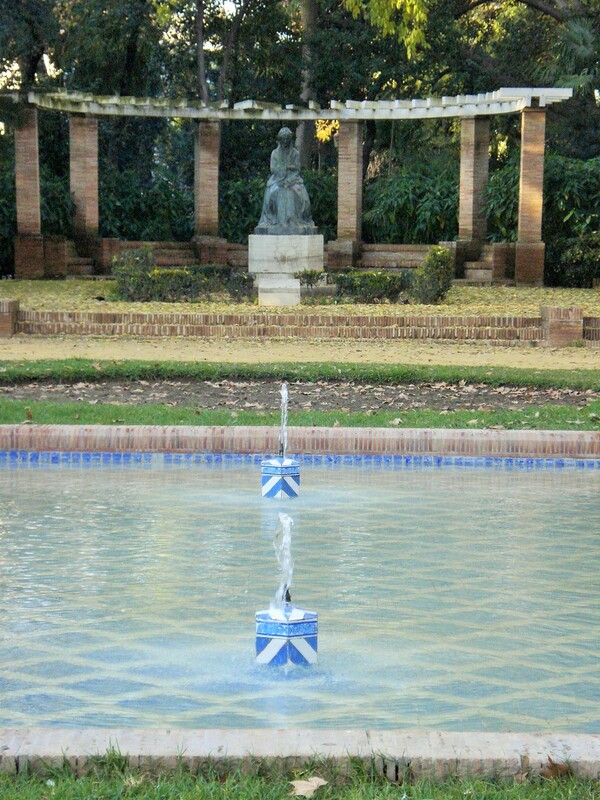 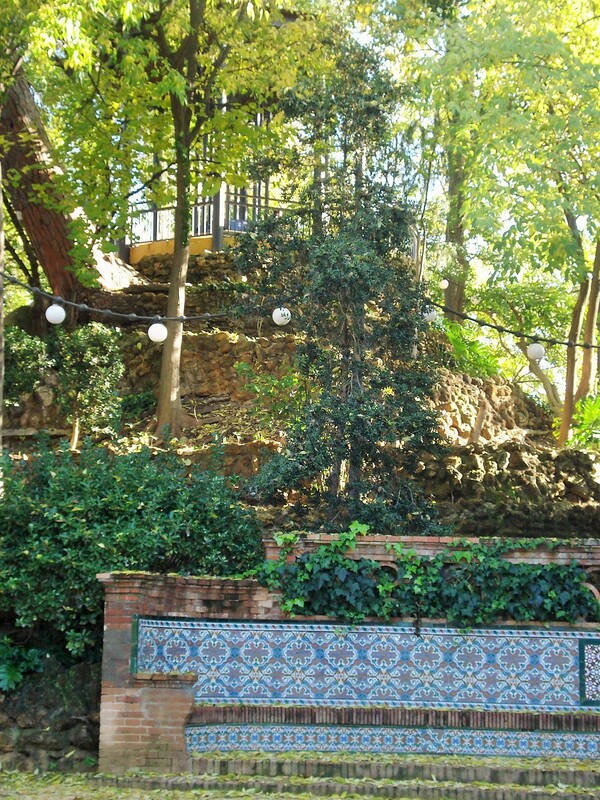 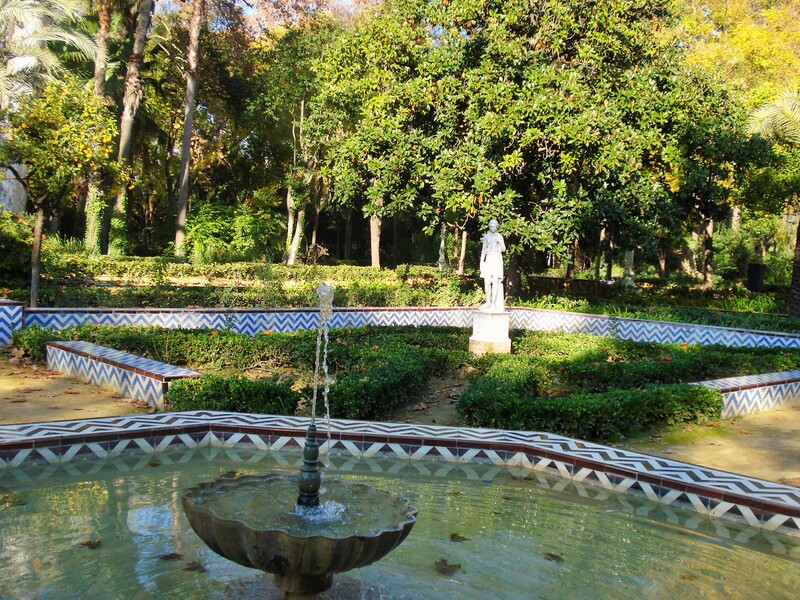 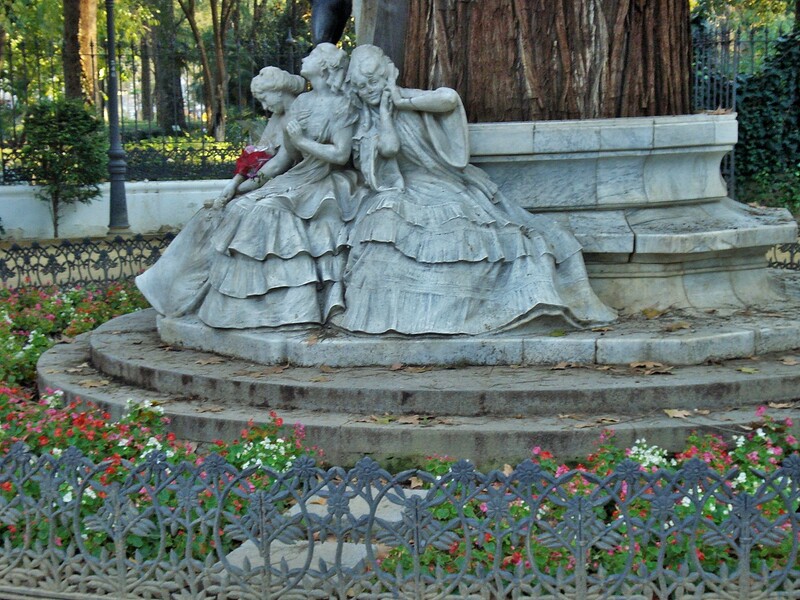 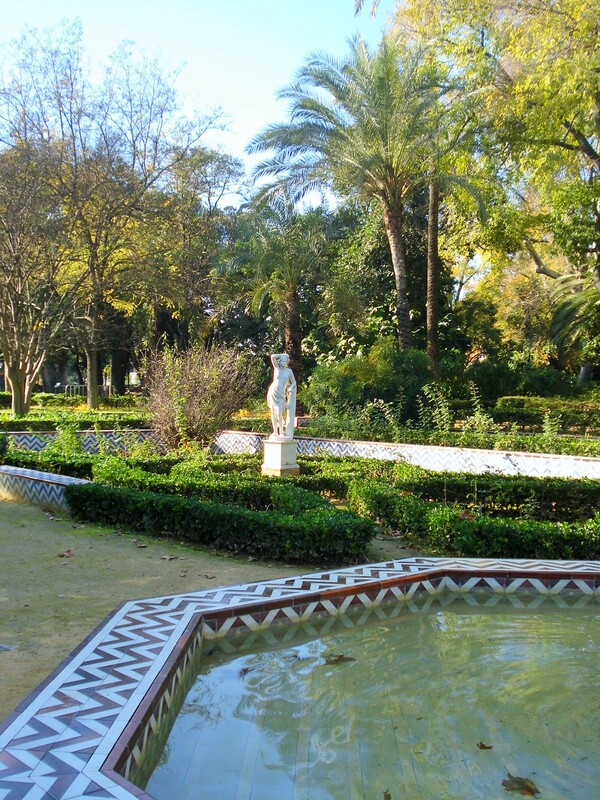 The Glorieta de las Conchas (8) features statues and planted borders arranged around a central fountain. 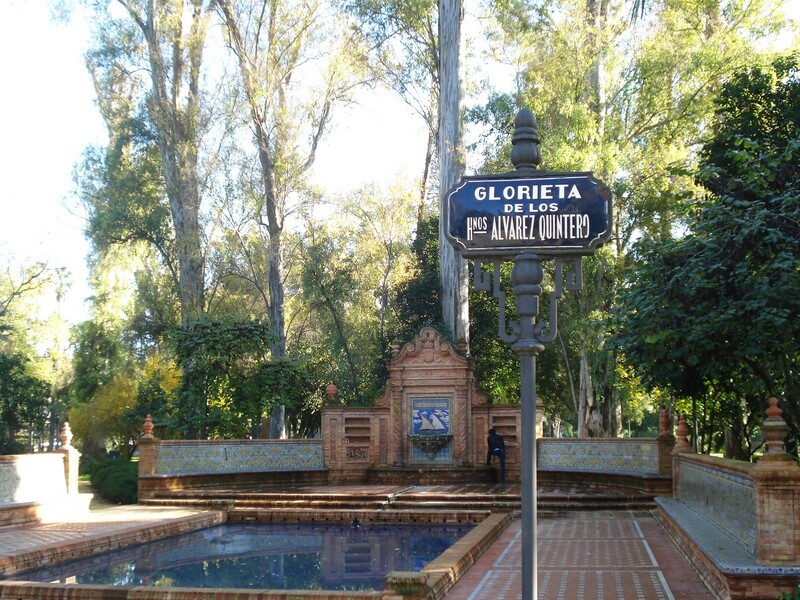 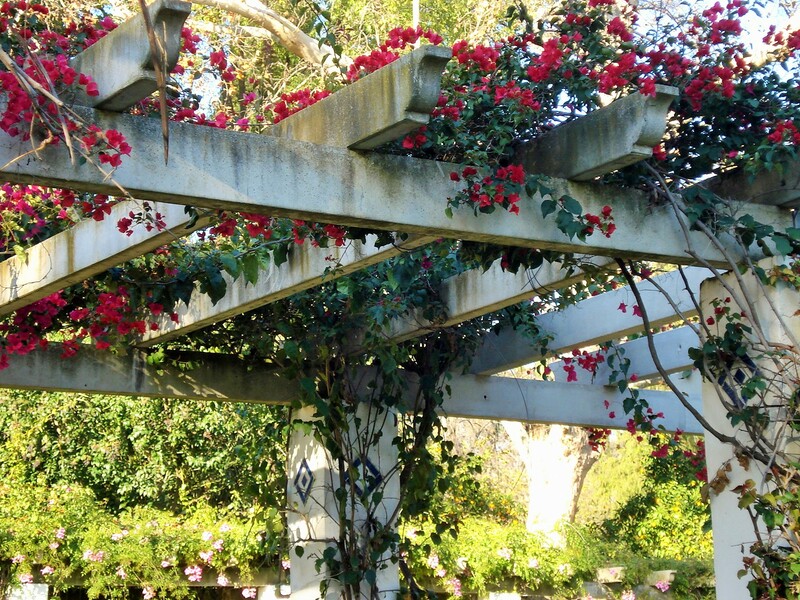 Glorieta de Dona Sol (9) has a beautiful mosaic surrounded by hedges, and Glorieta de Ofelia Nieto (10_ is a meandering arbor covered in trumpet vines and bougainvilleas. 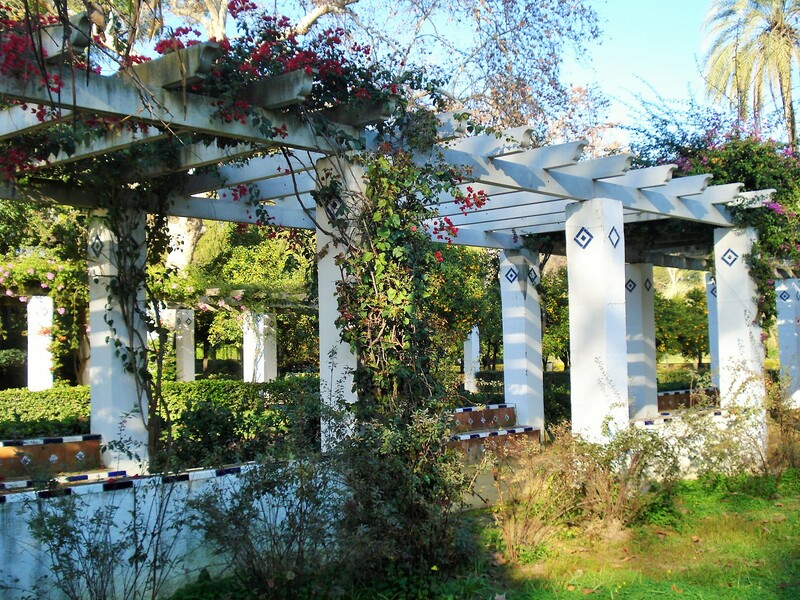 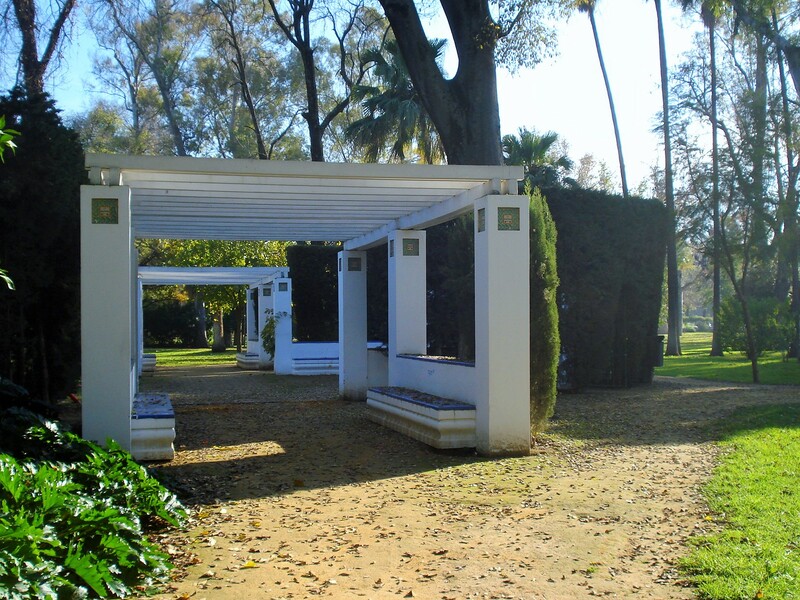 At the end of the avenue is the Museum of Archeology (30), also built for the 1929 Exhibition. 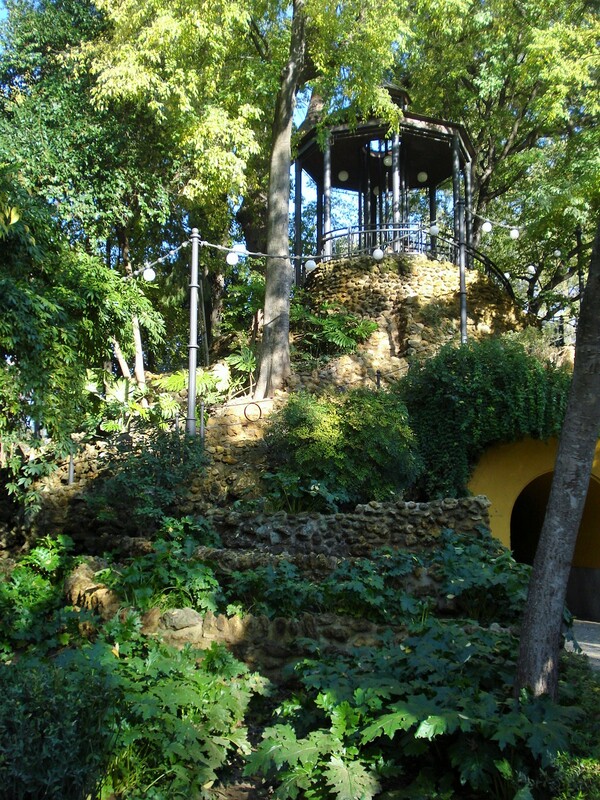 Leading towards the Fountain of the Lions is Gurugu Mountain (15 on the map), a small mad made “mount” with an observation point and gazebo up top. 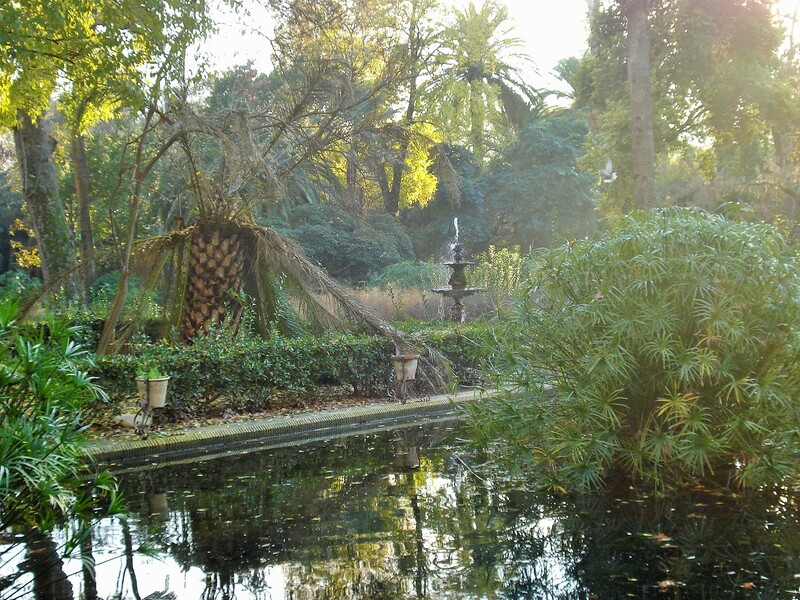 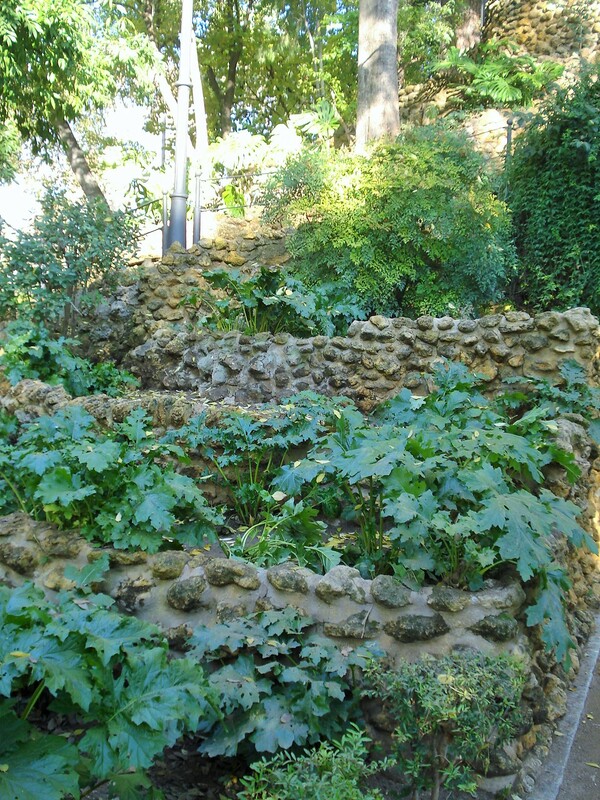 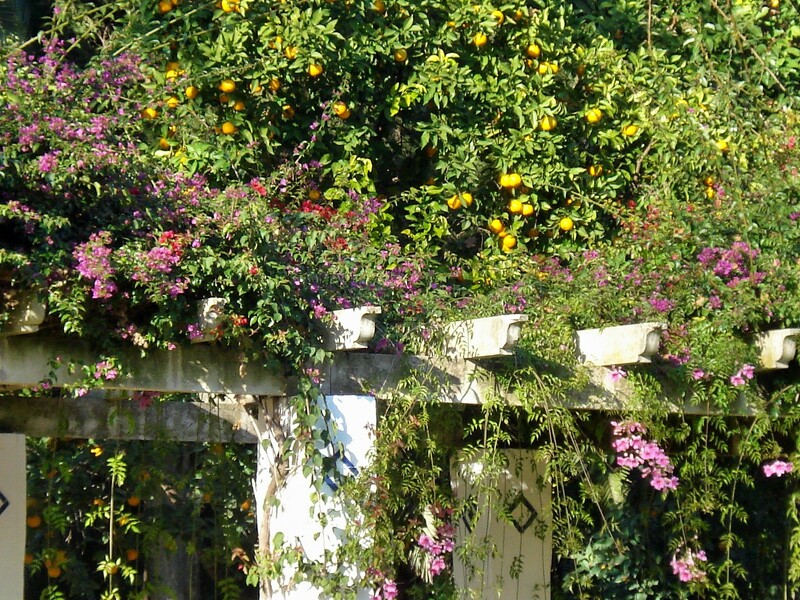 This is a perfect example of Forestier’s playfulness in garden design, interjecting surprises at every turn throughout his gardens. 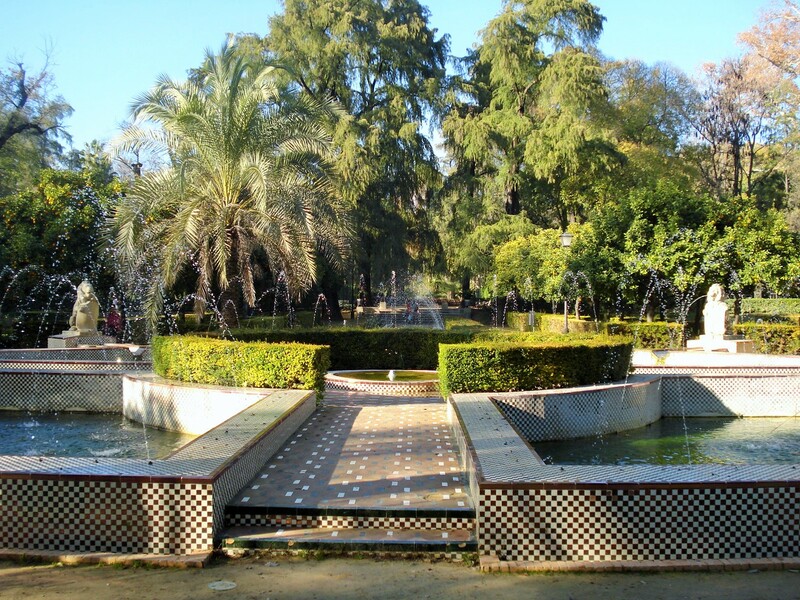 This park being such an expansive and complex creation, I am featuring it through several posts.This last post features the Water-lily Pool (Estanque de los Lotos). 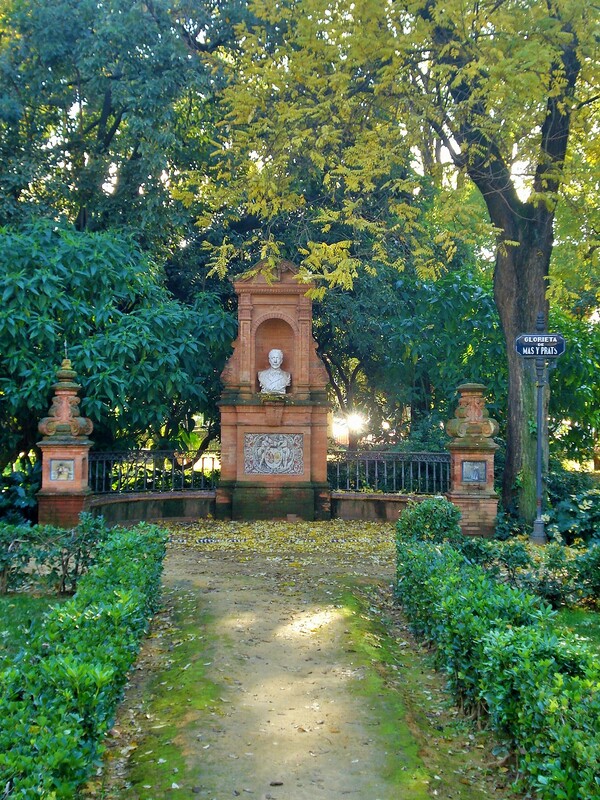 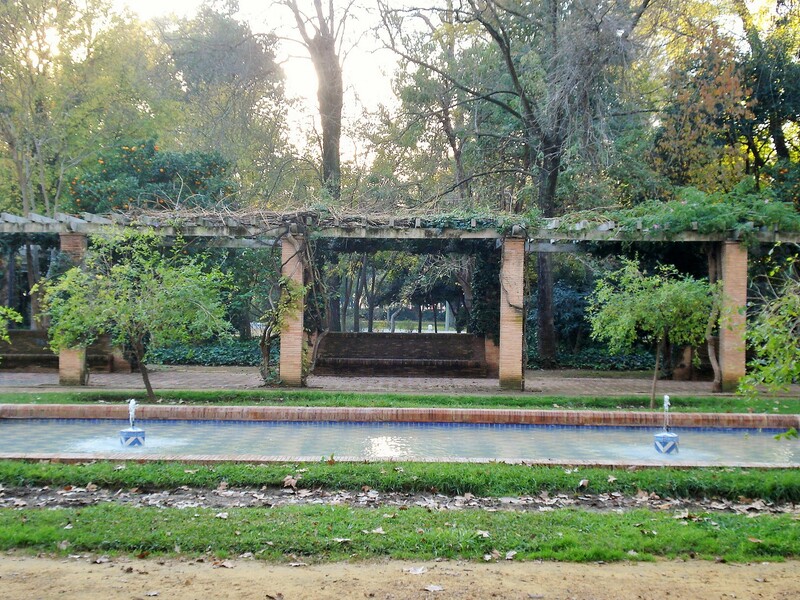 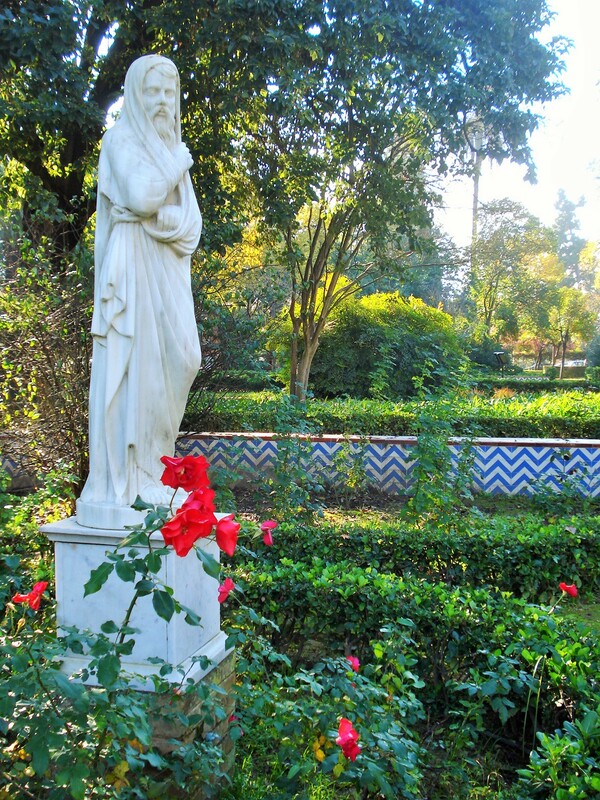 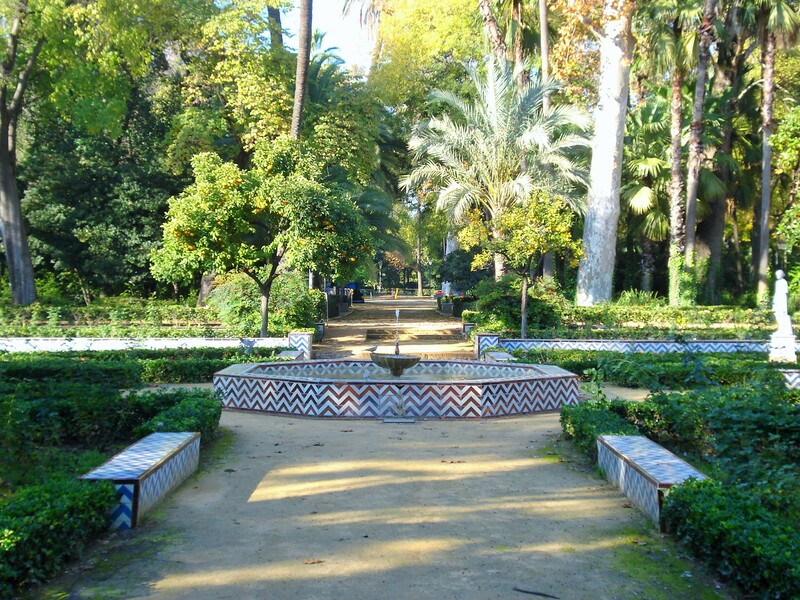 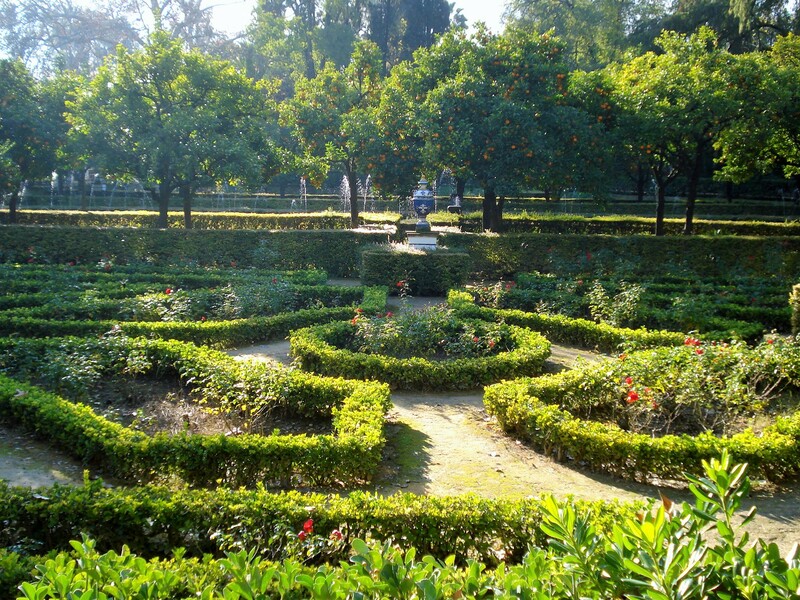 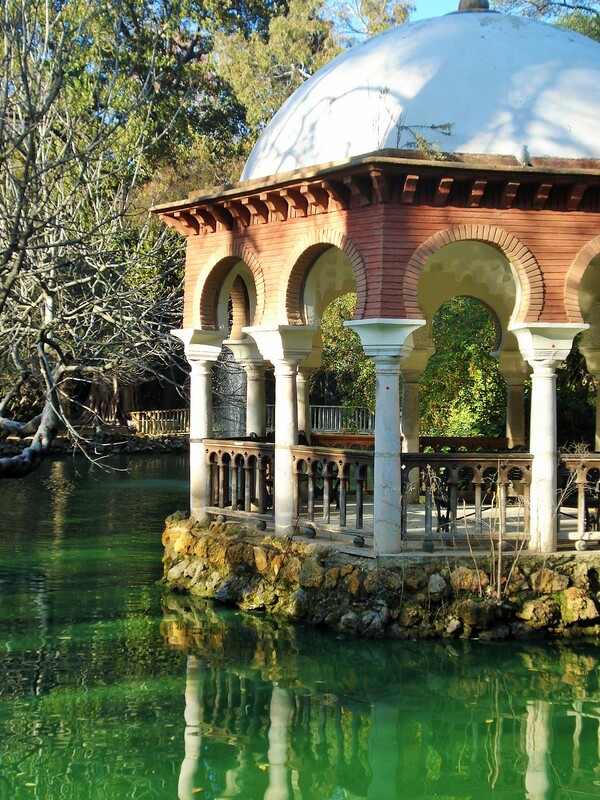 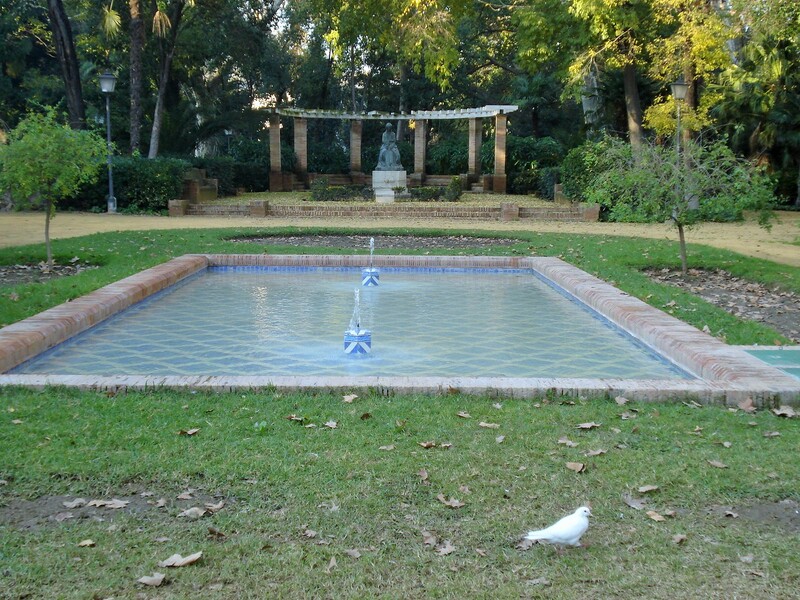 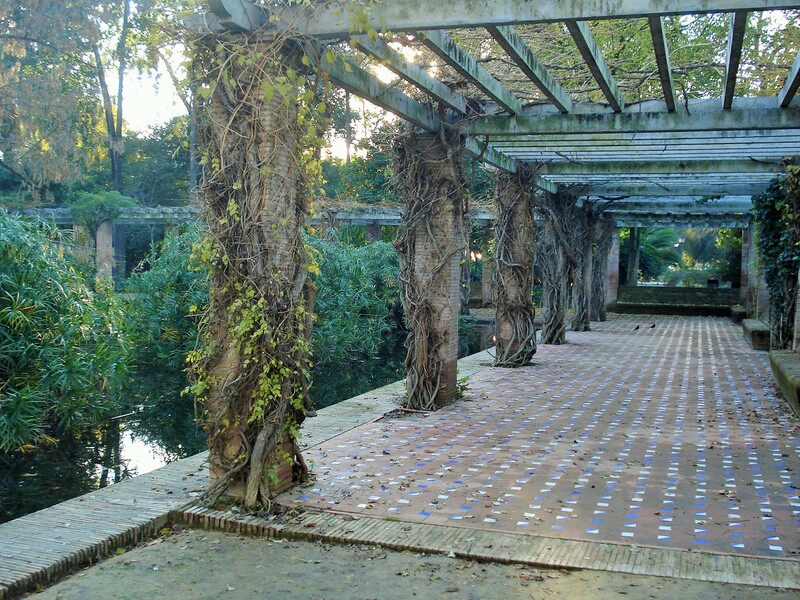 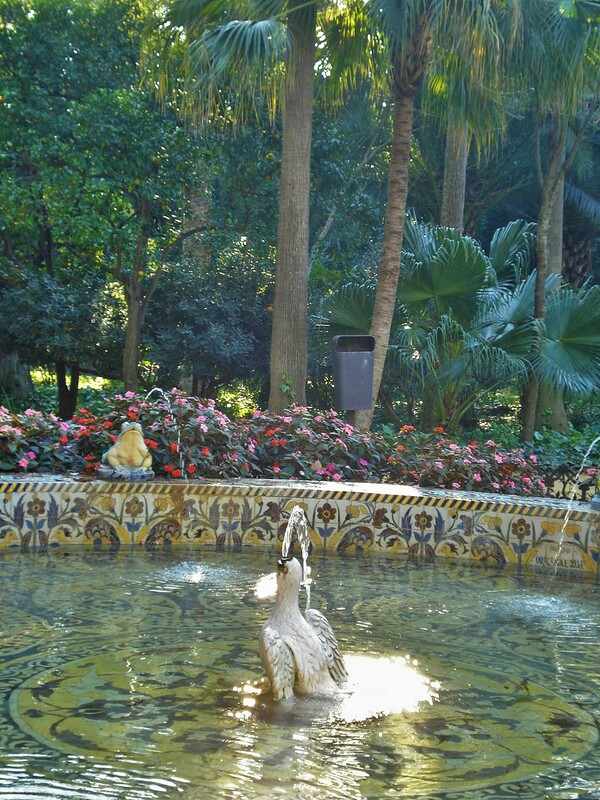 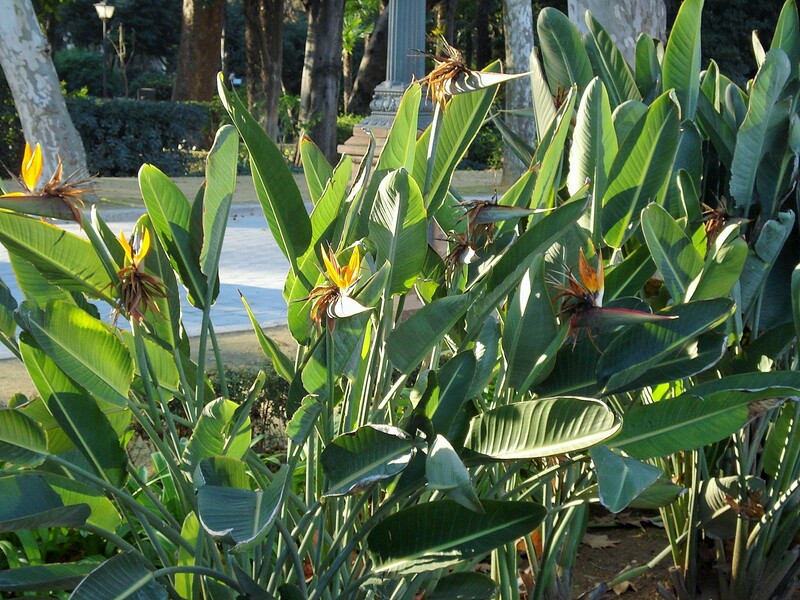 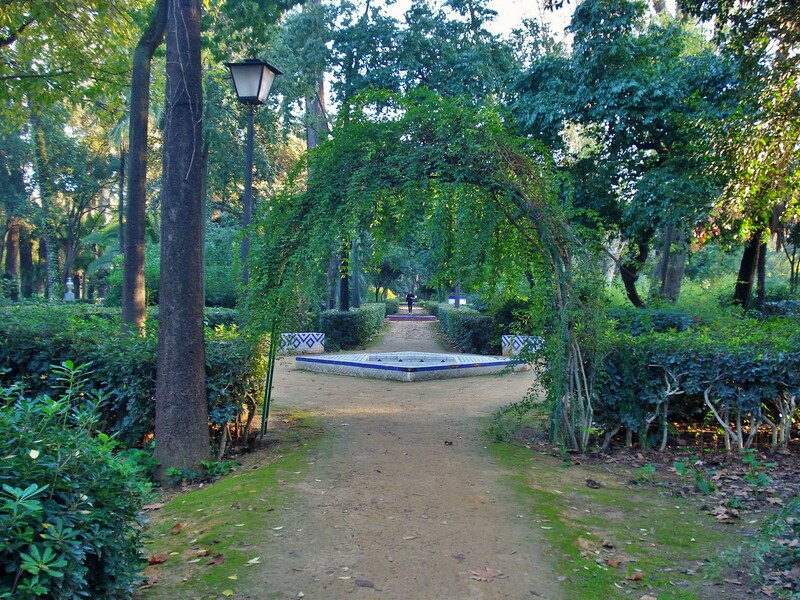 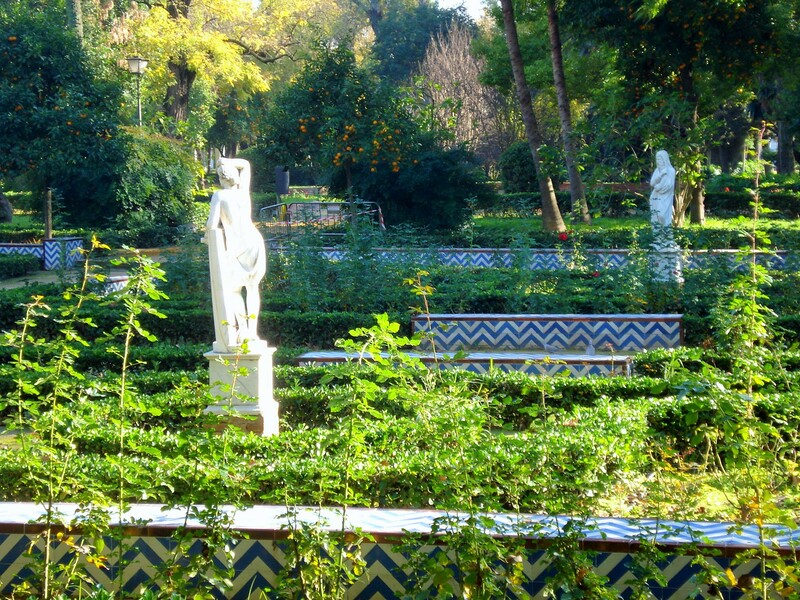 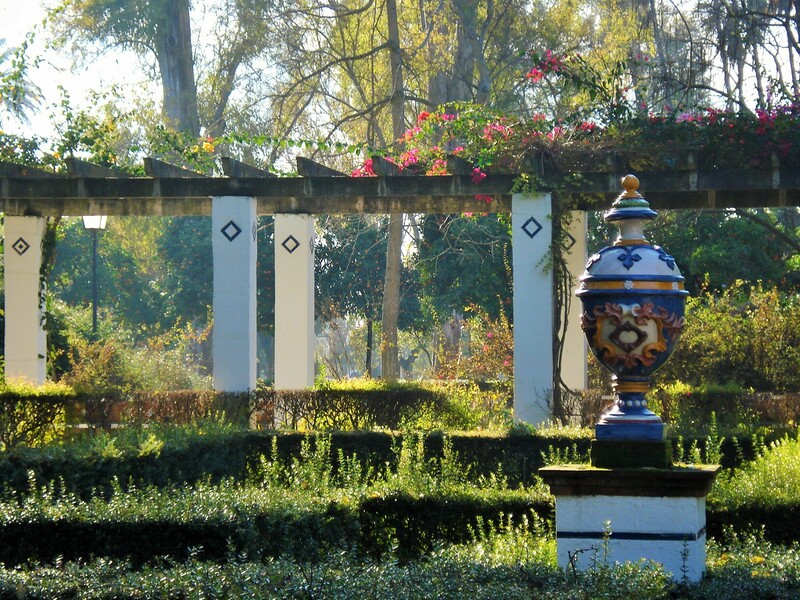 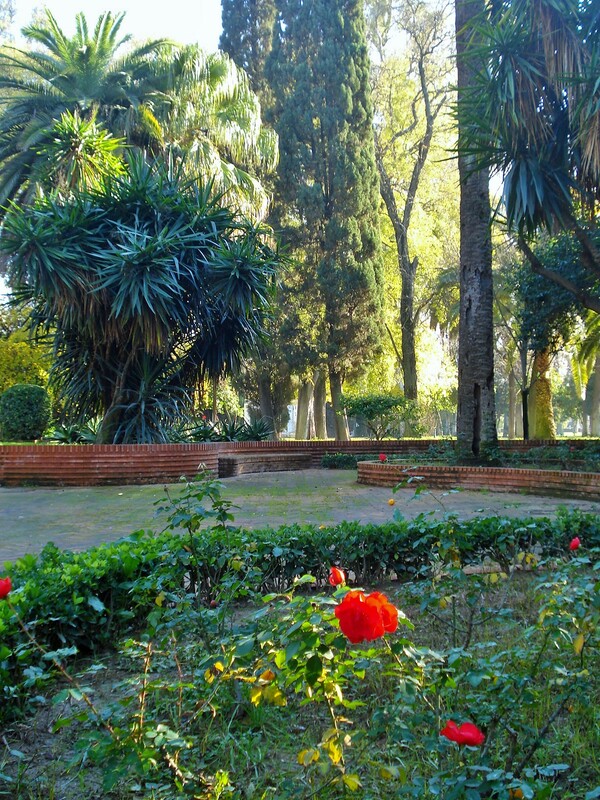 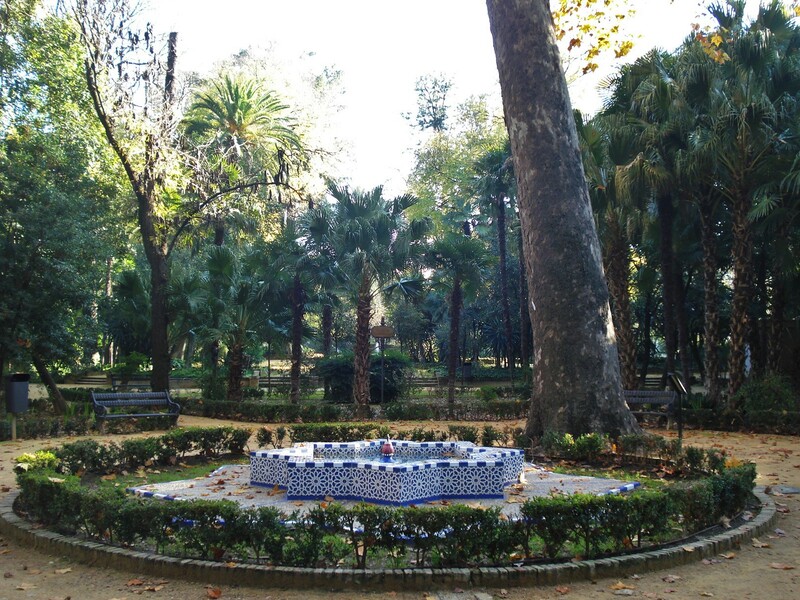 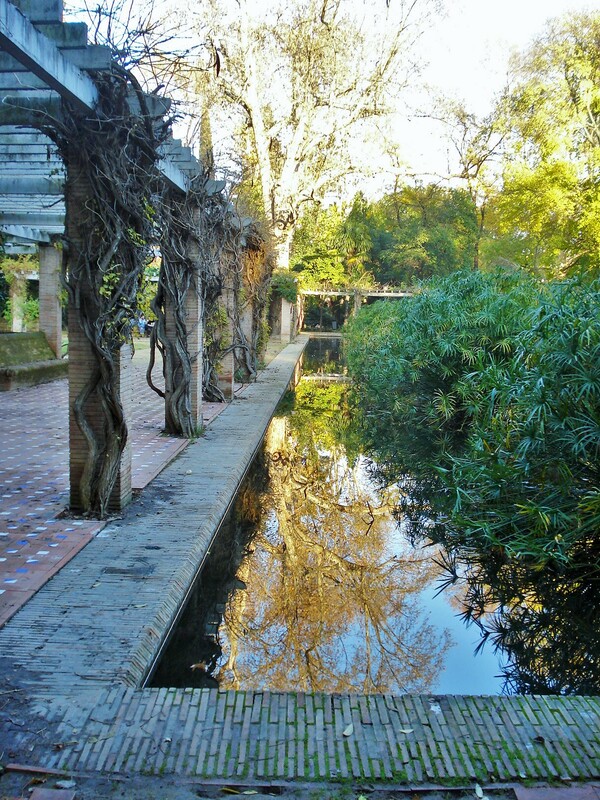 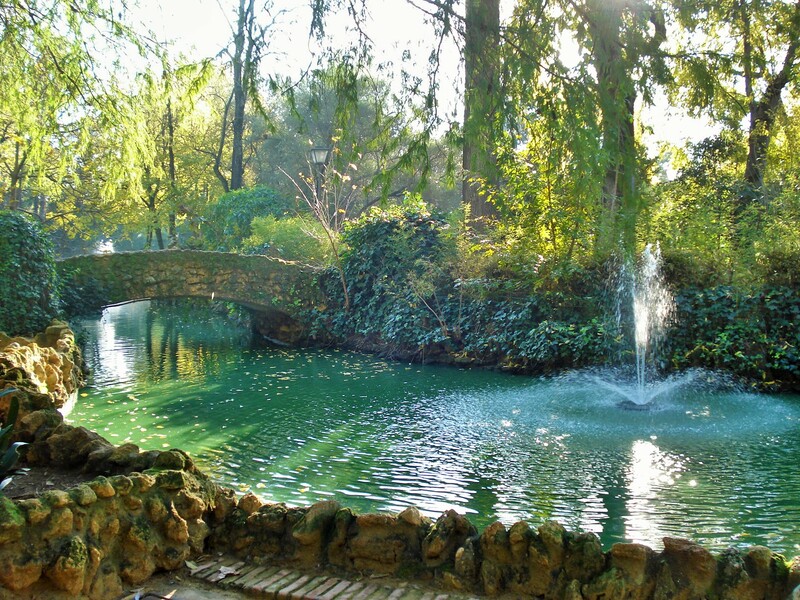 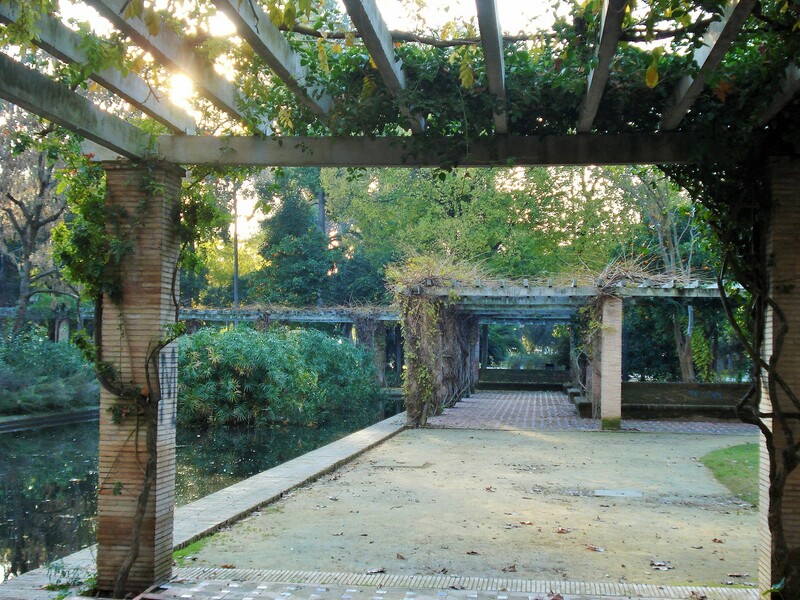 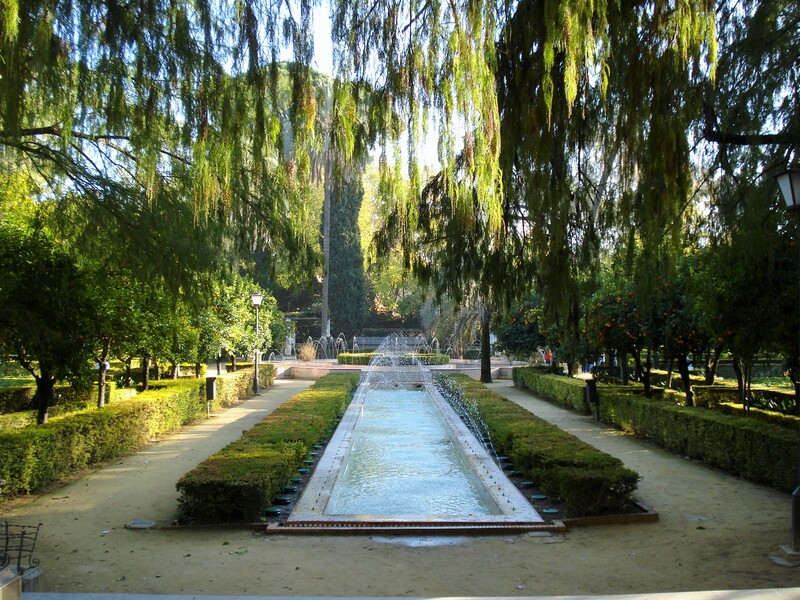 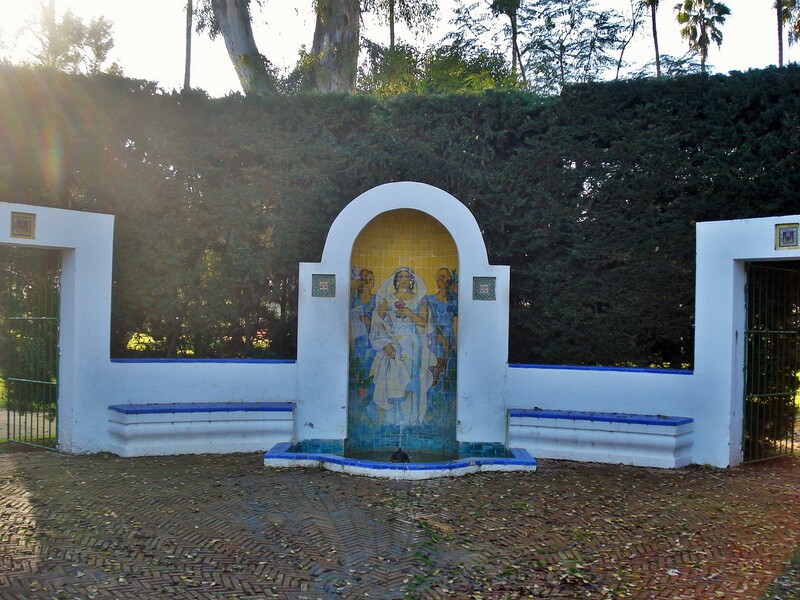 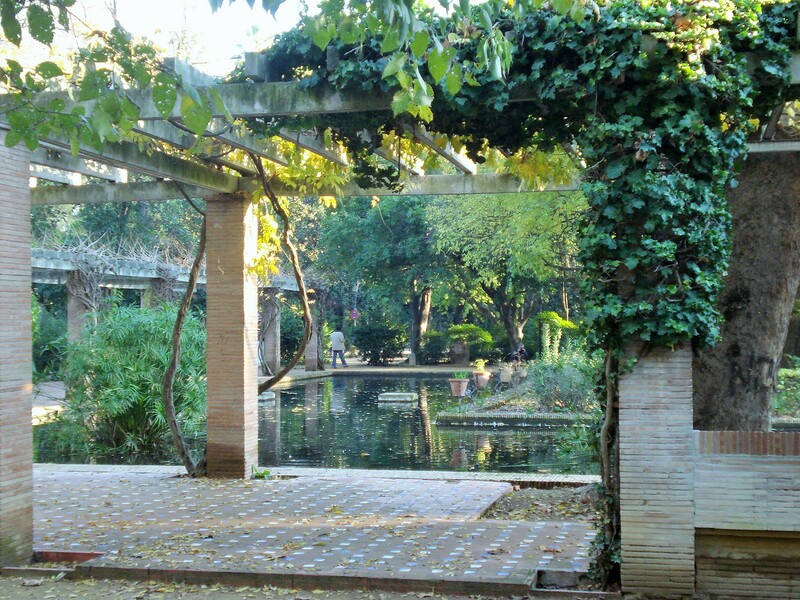 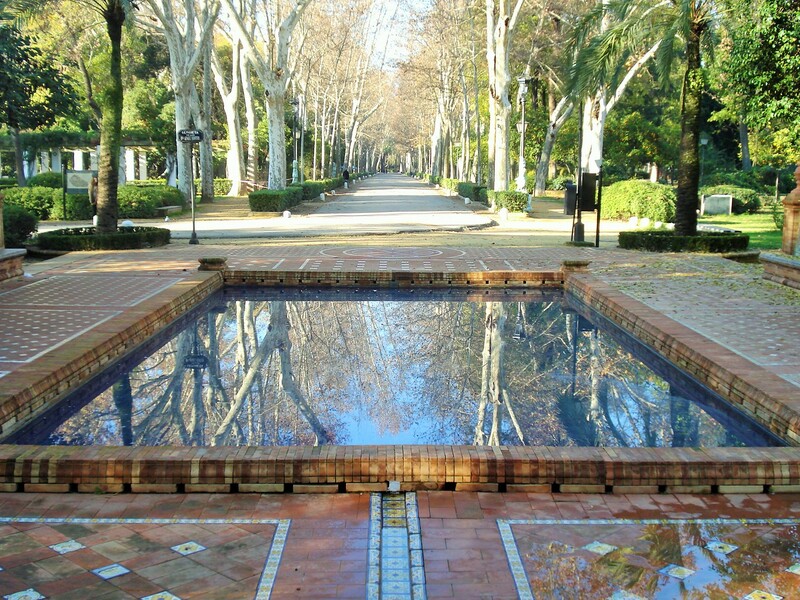 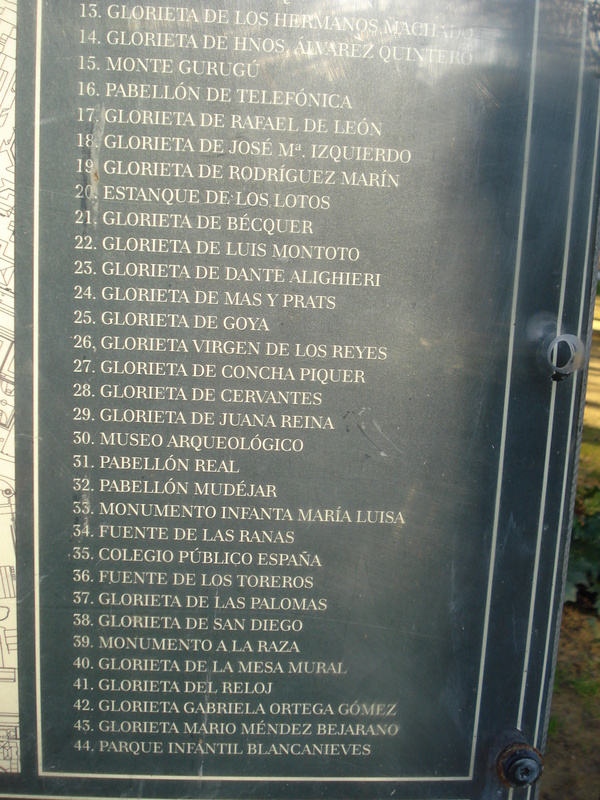 On the way from de Island of the Birds to the Lily Pool is the Glorieta de Juana Reina, named after a famous Spanish actress born in Sevilla in 1929. 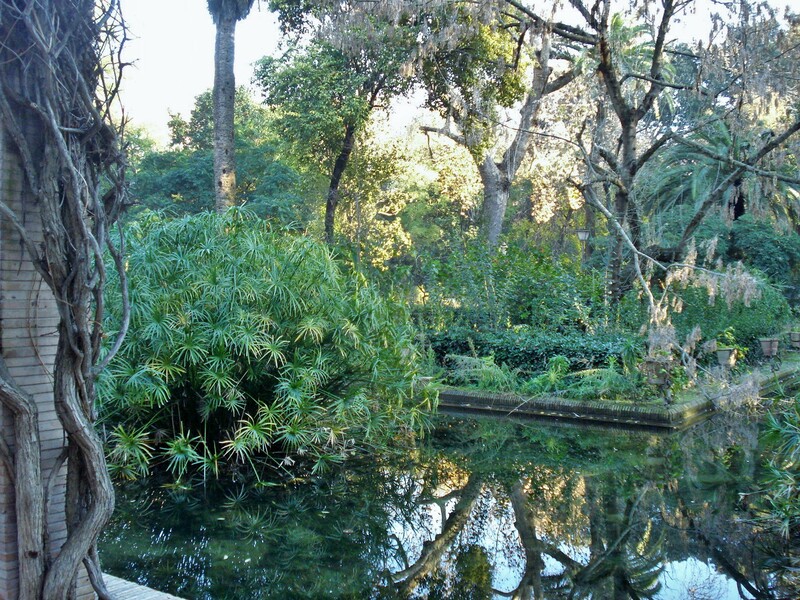 Then at the western end of the Park, one reaches the Water-lily Pool (Estanque de los Lotos), a stunning pond bordered by arbors. 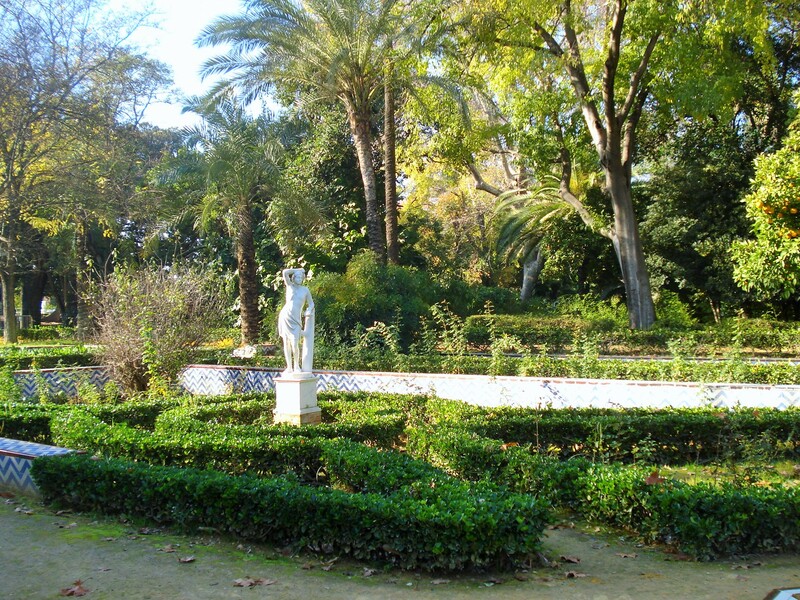 To the side is another pond and statuary. 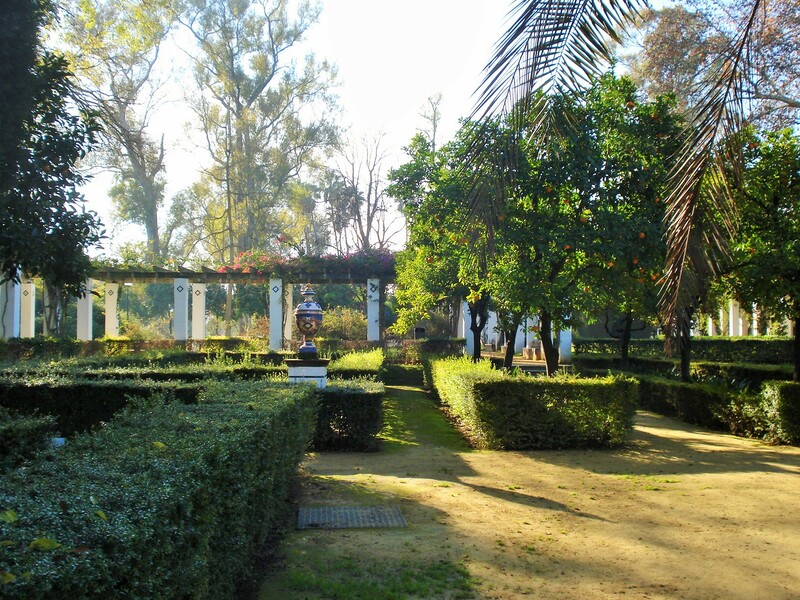 Towards the exit gate are centennial trees. 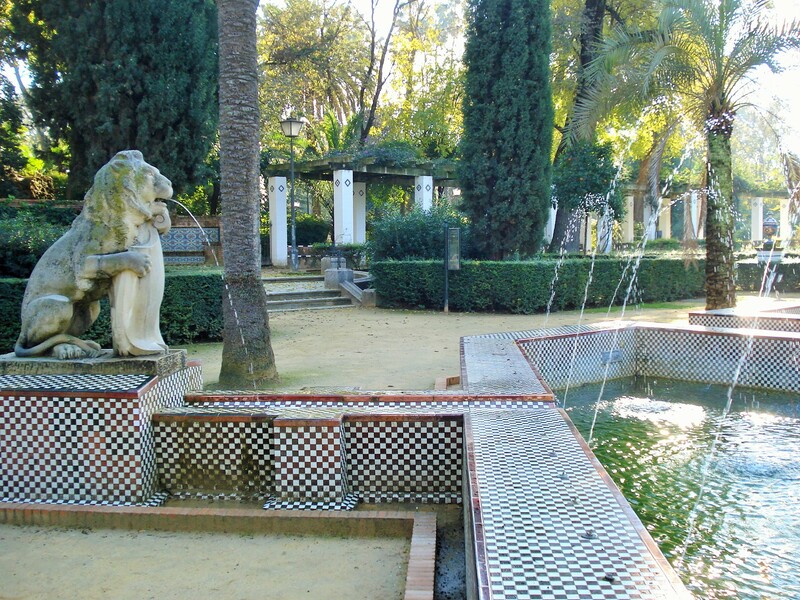 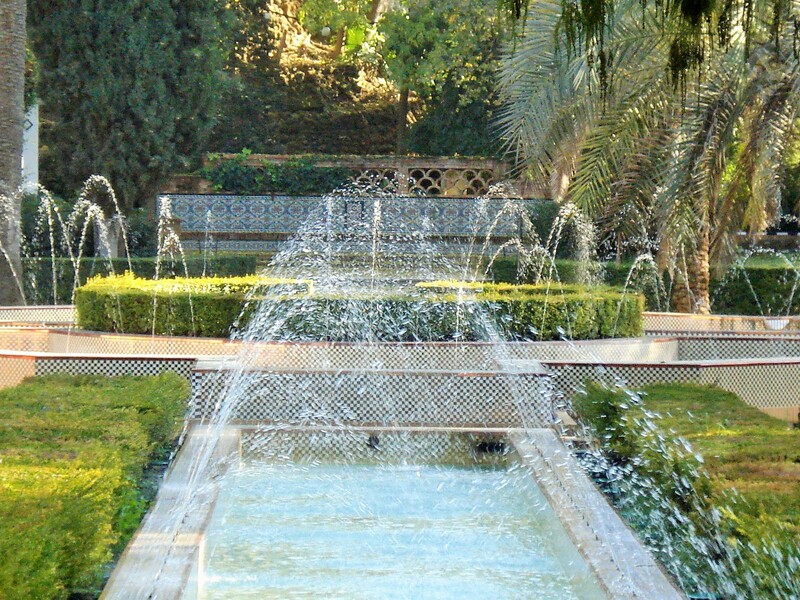 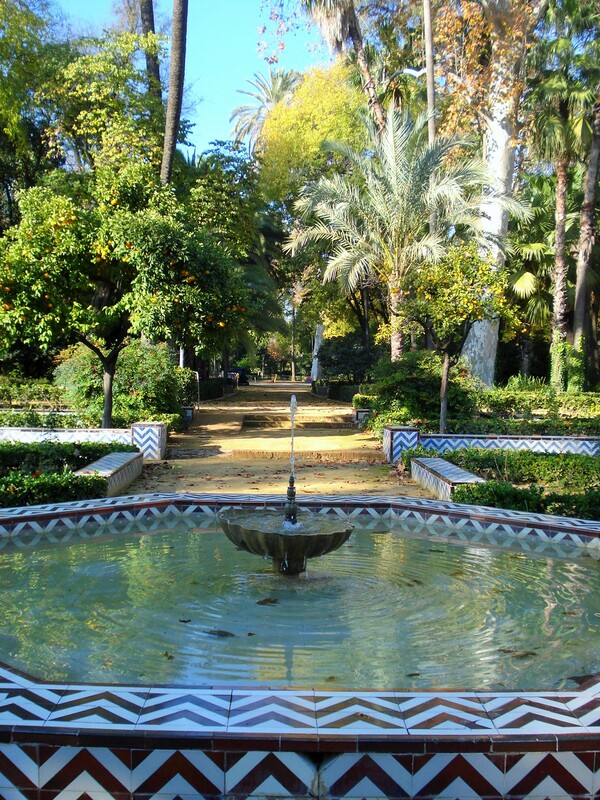 An alley with a series of fountains in the Moorish style to the southern gate. 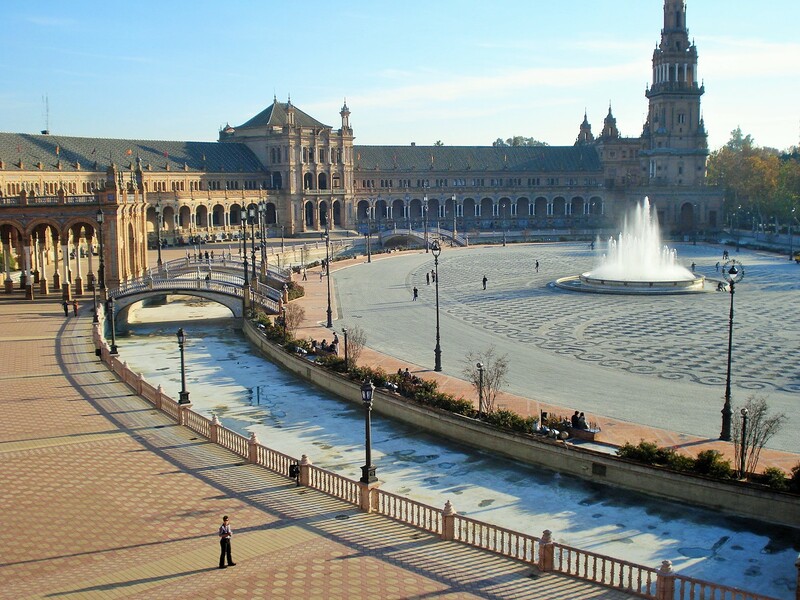 This park being such an expansive and complex creation, I am featuring it through several posts.This one one showcases the Plaza de Espana. 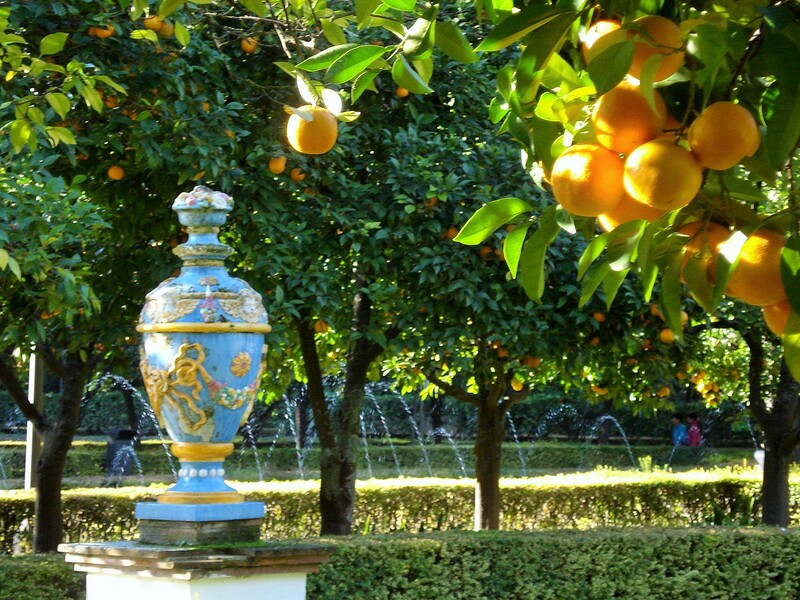 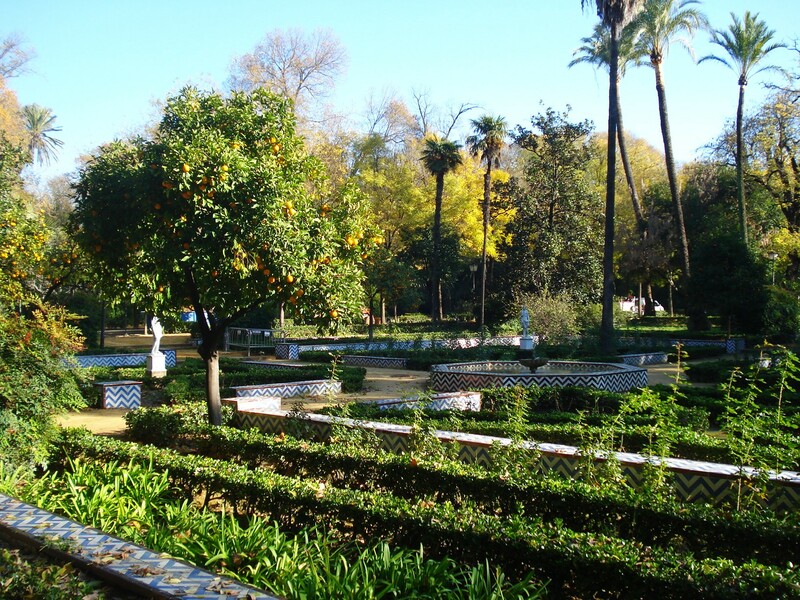 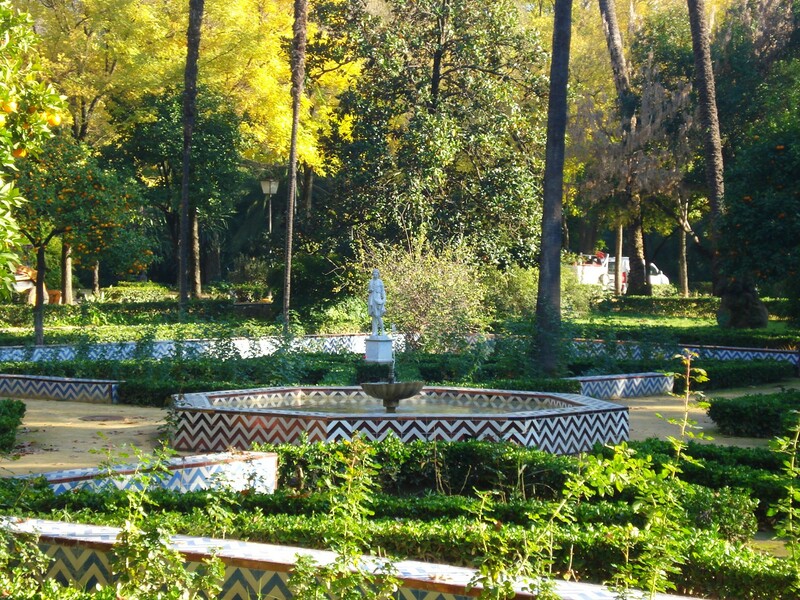 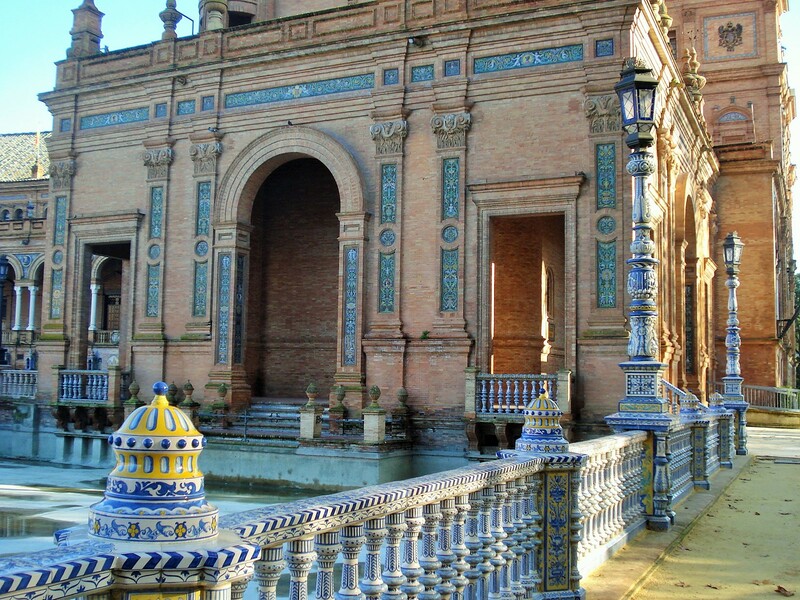 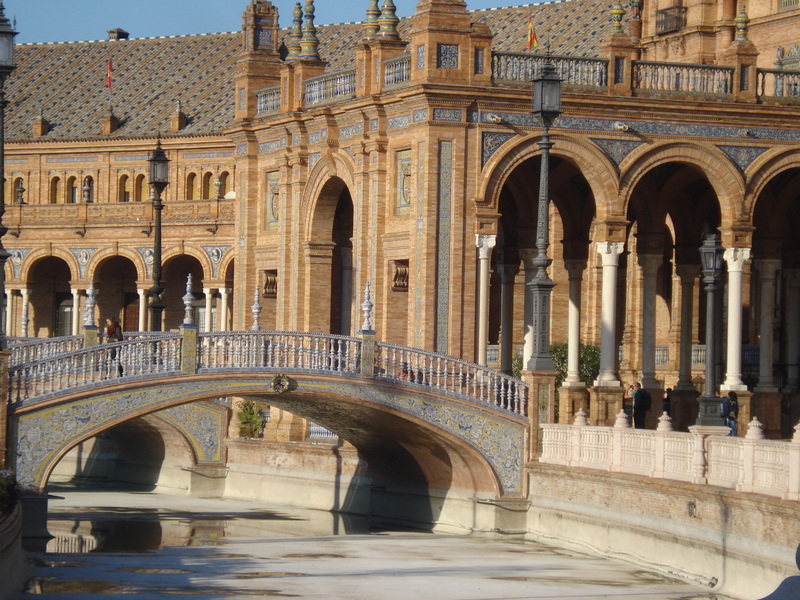 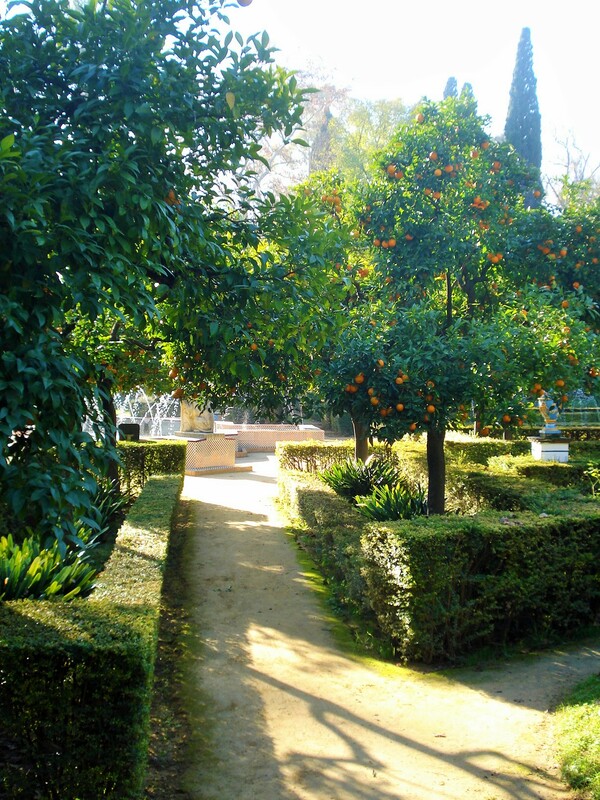 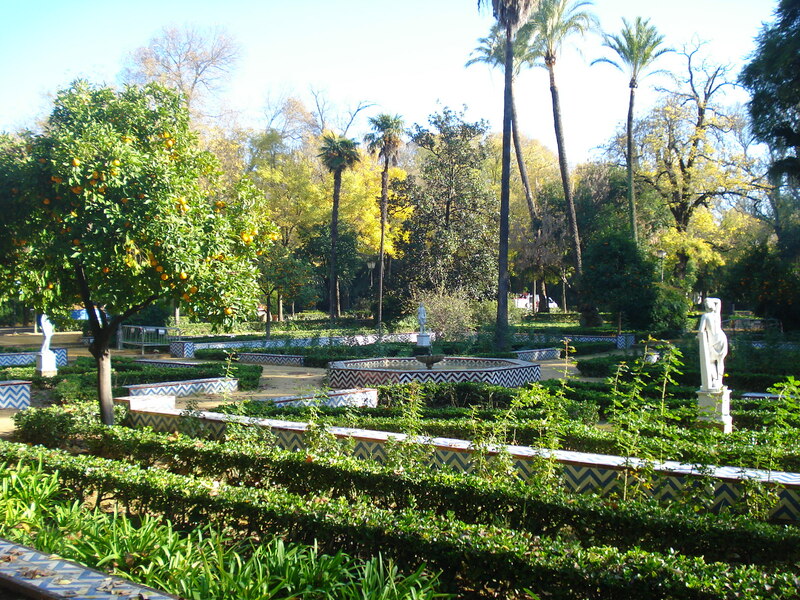 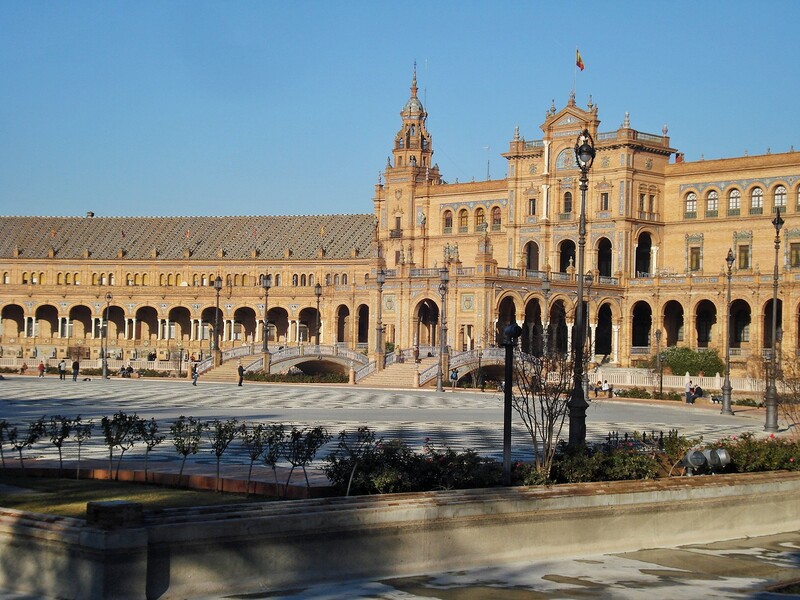 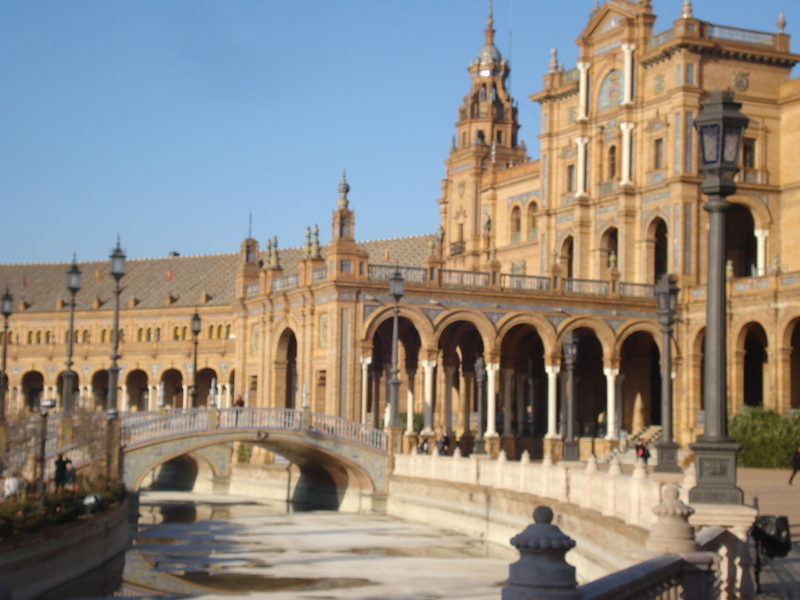 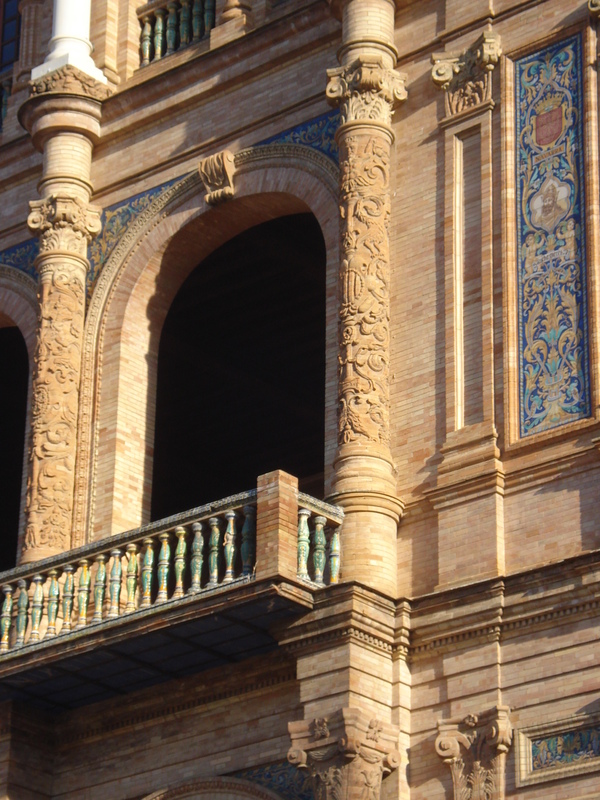 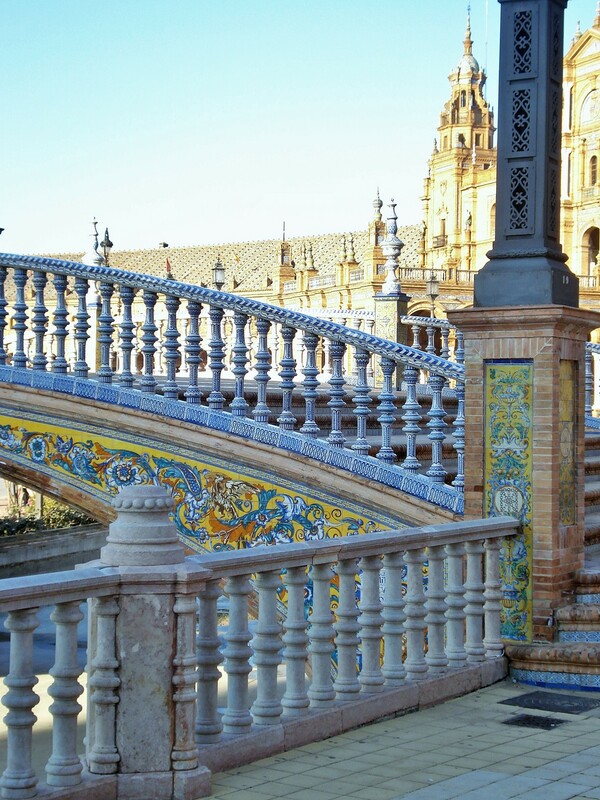 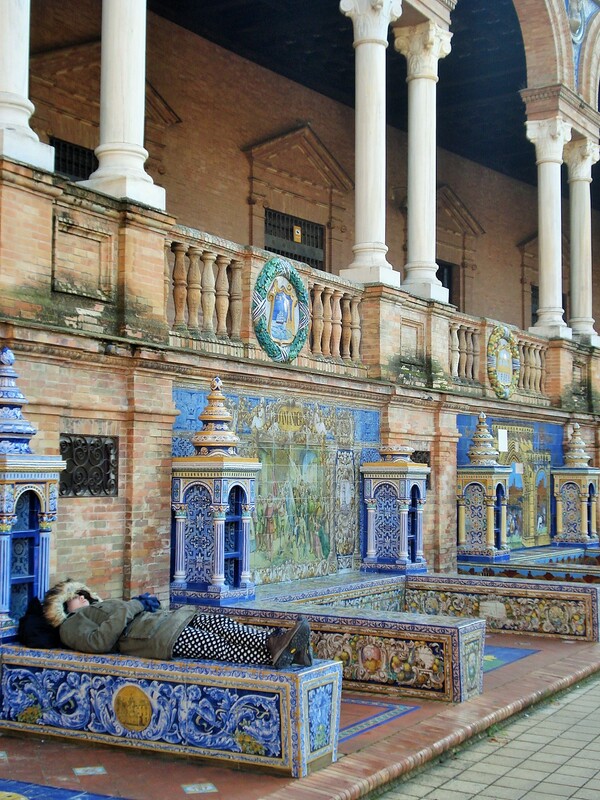 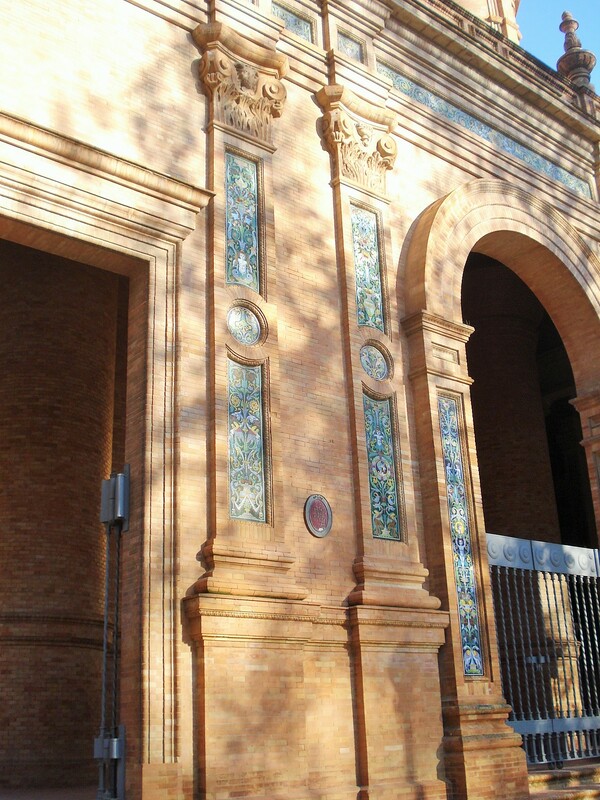 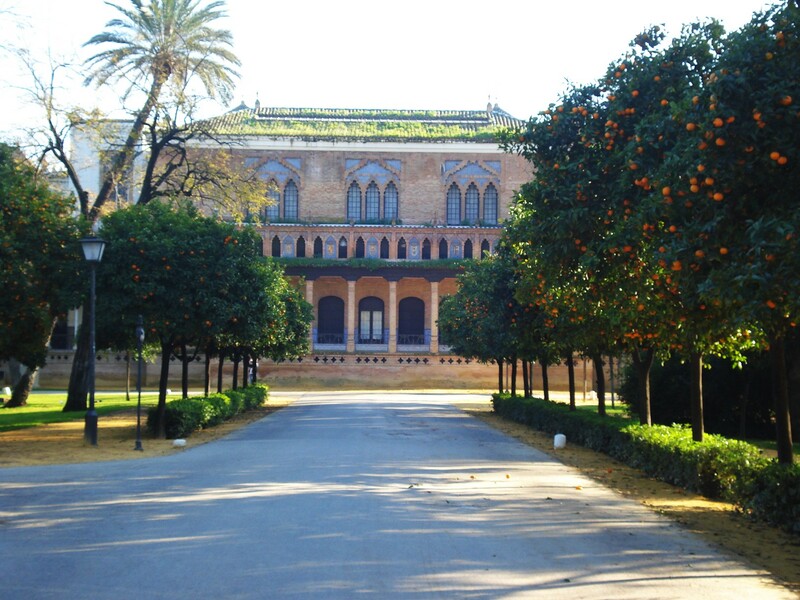 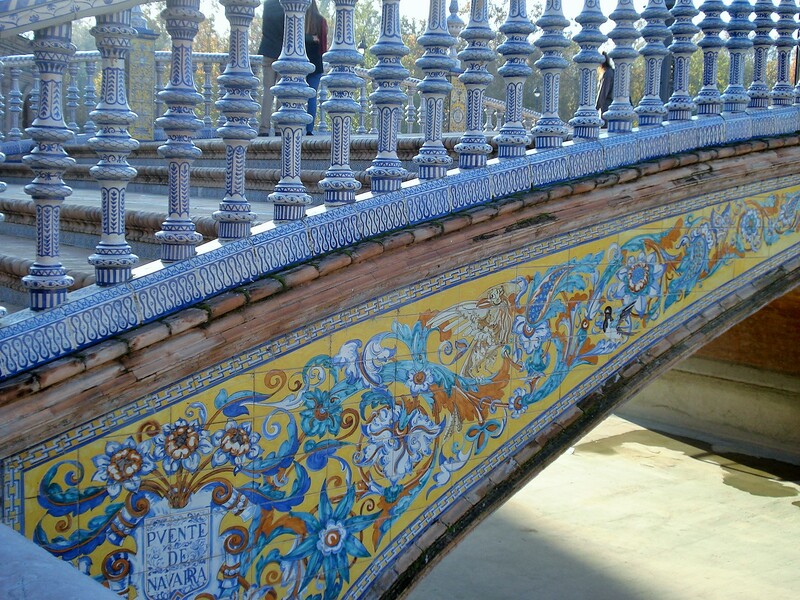 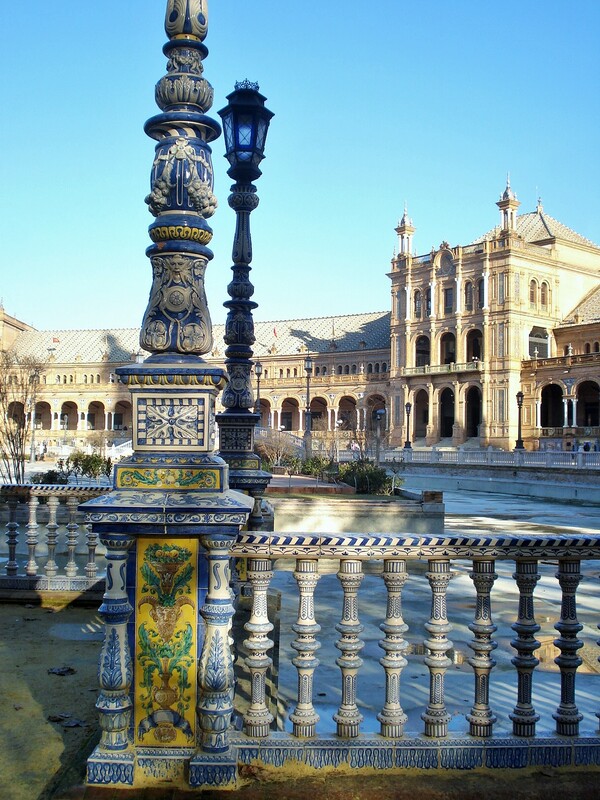 Although not strictly a garden of course, the Plaza de Espana is not only emblematic of the city of Seville, but also the focal point of the park around which much of the gardens are laid out. 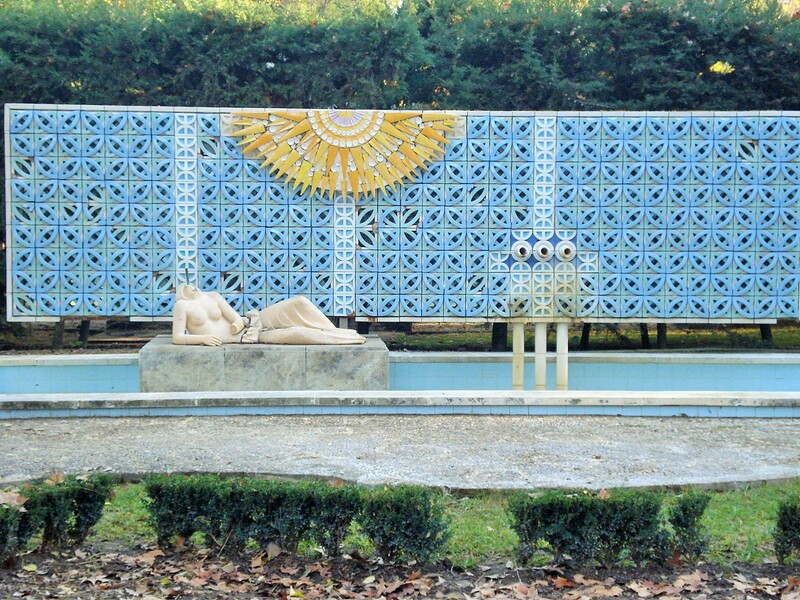 It was designed for the World Fair of 1929 and is now used for central government offices. 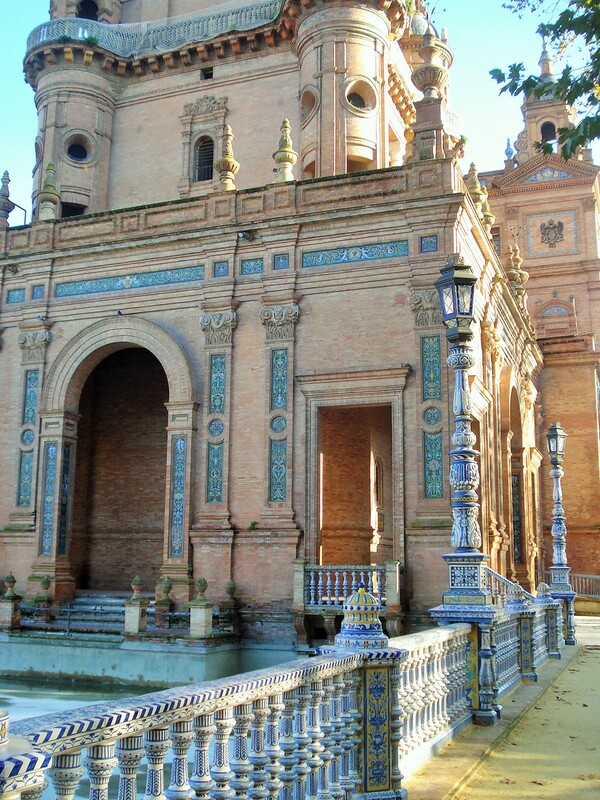 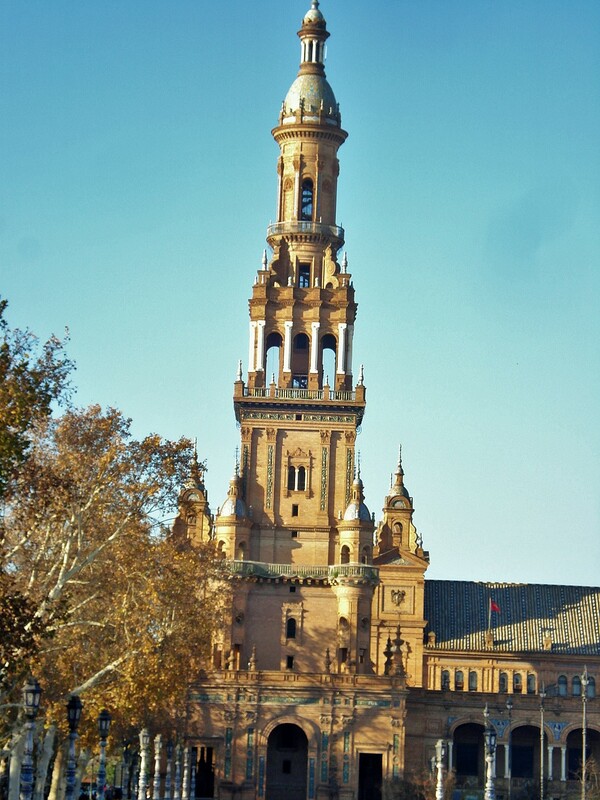 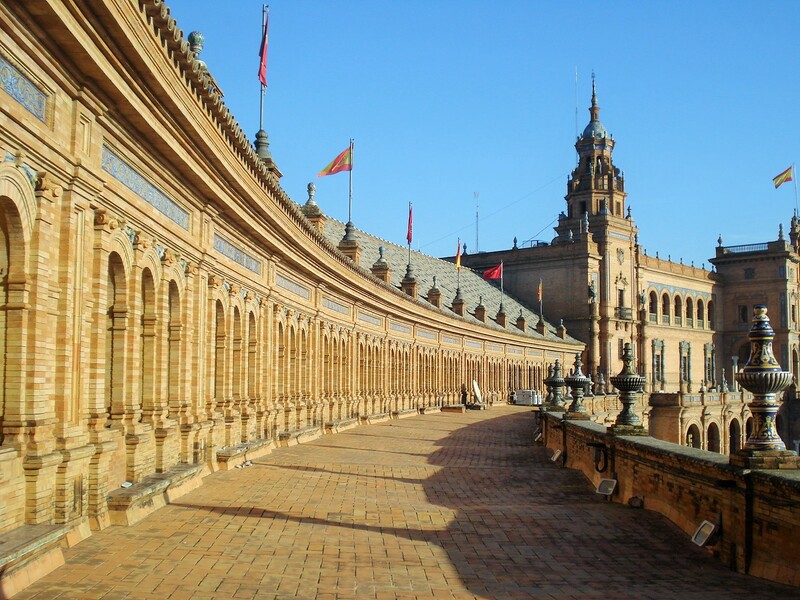 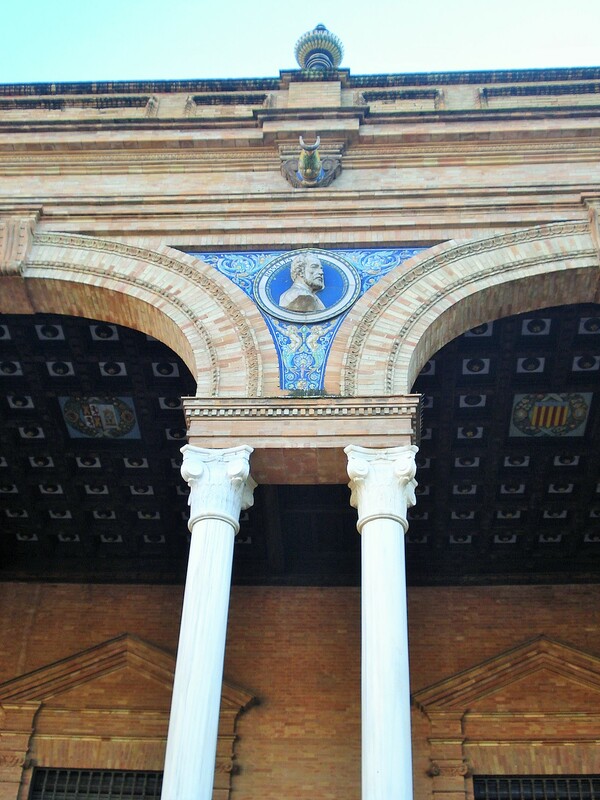 It is a masterpiece of Renaissance Revival architecture, designed by Aníbal González. 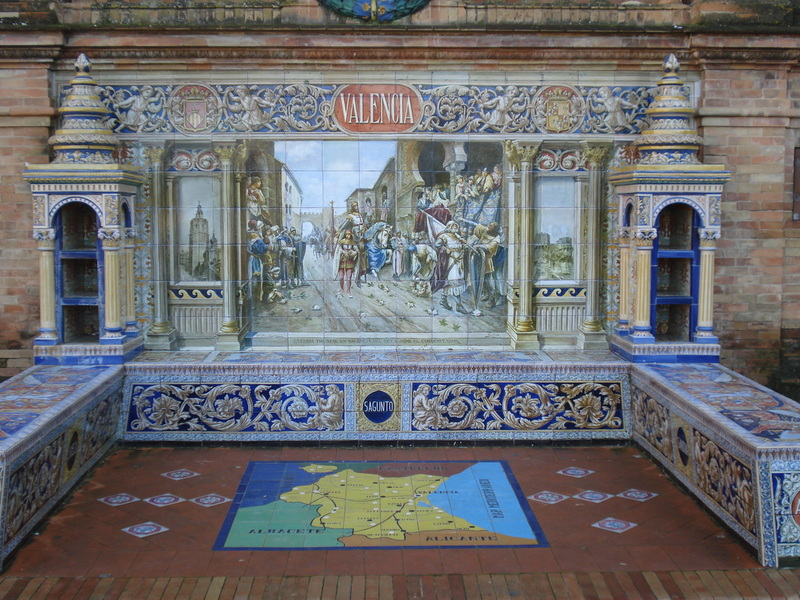 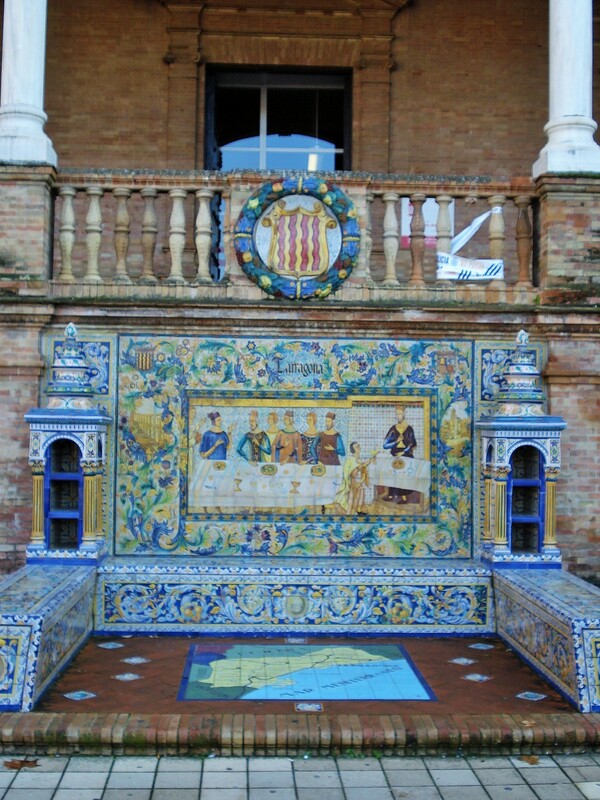 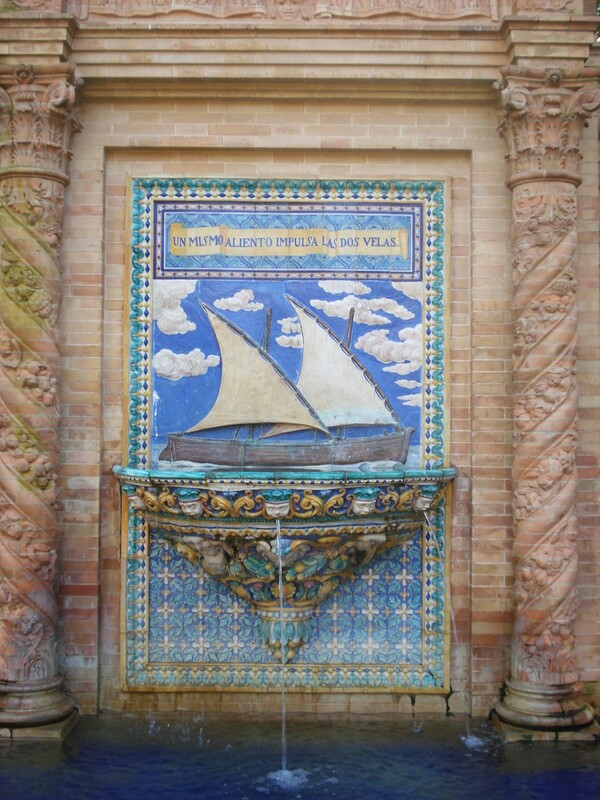 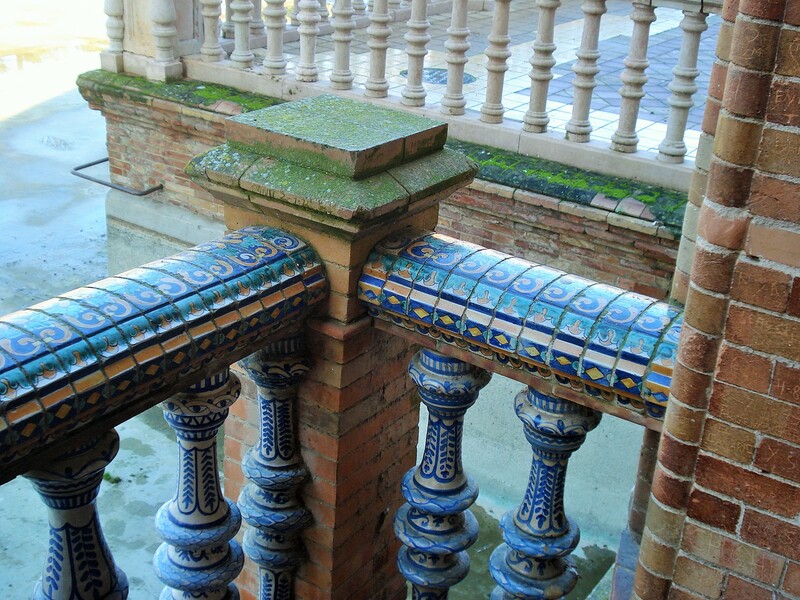 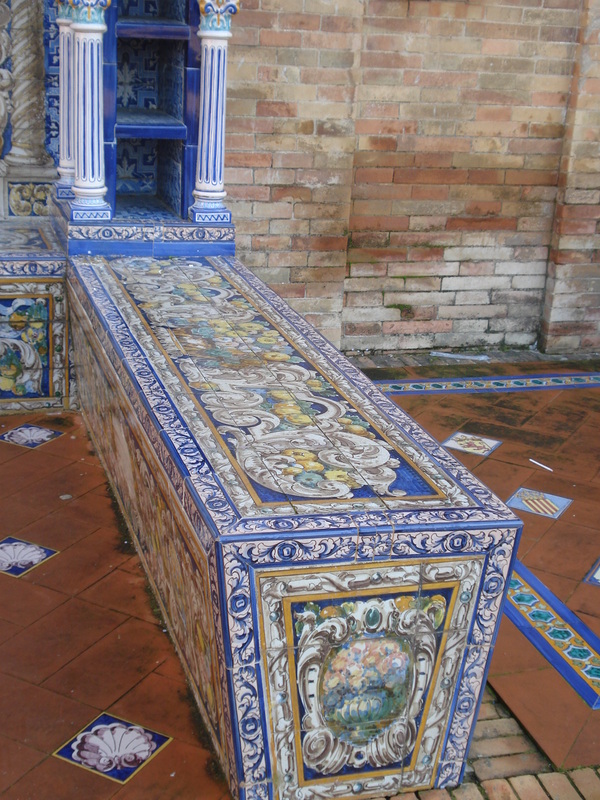 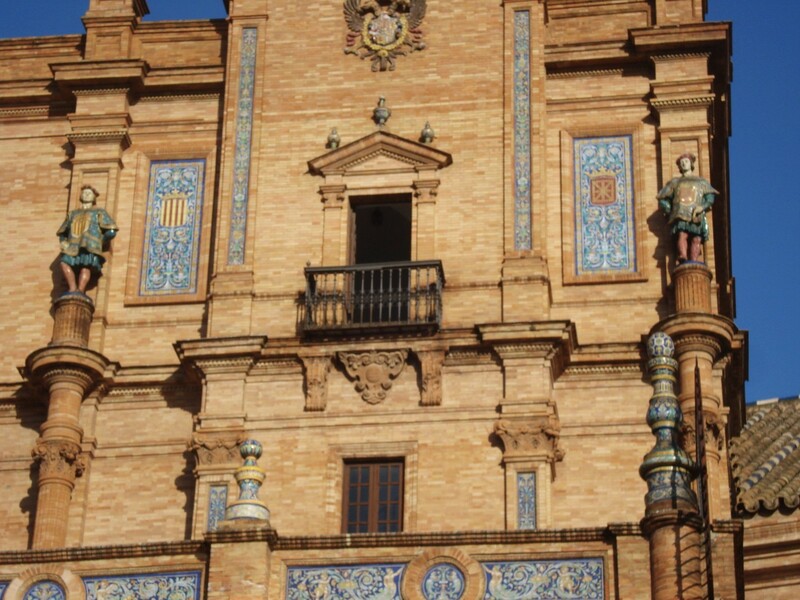 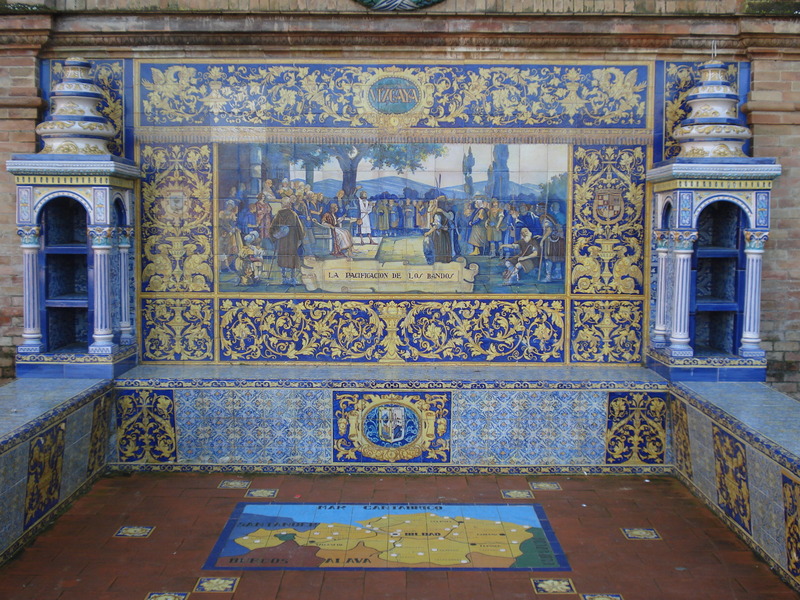 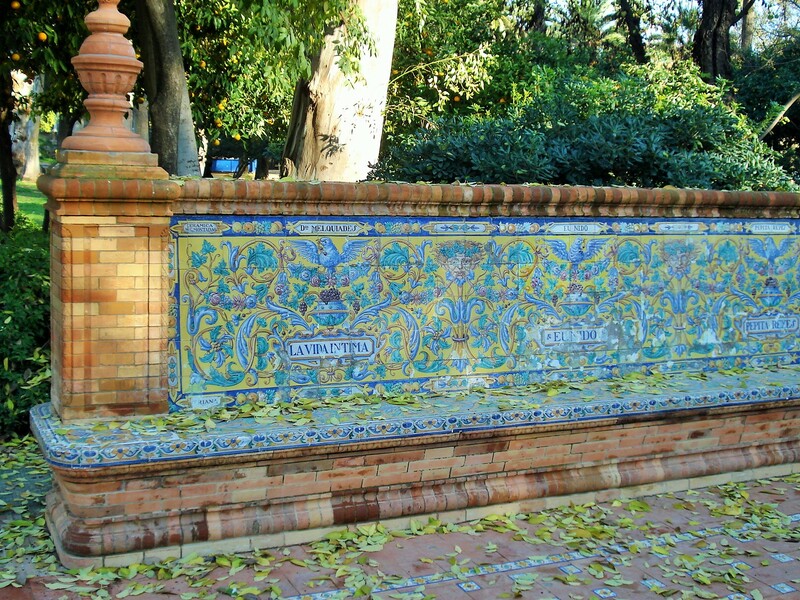 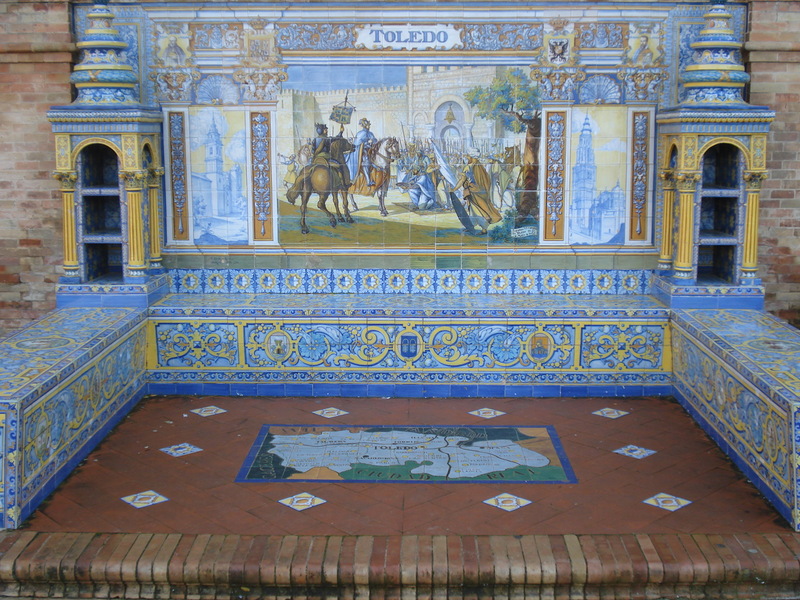 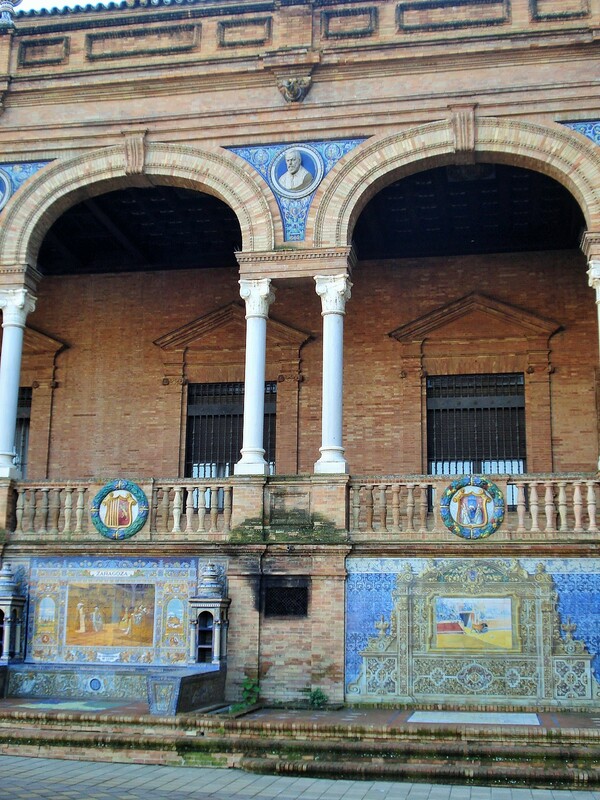 It features a series of tiled alcoves representing the provinces of Spain. 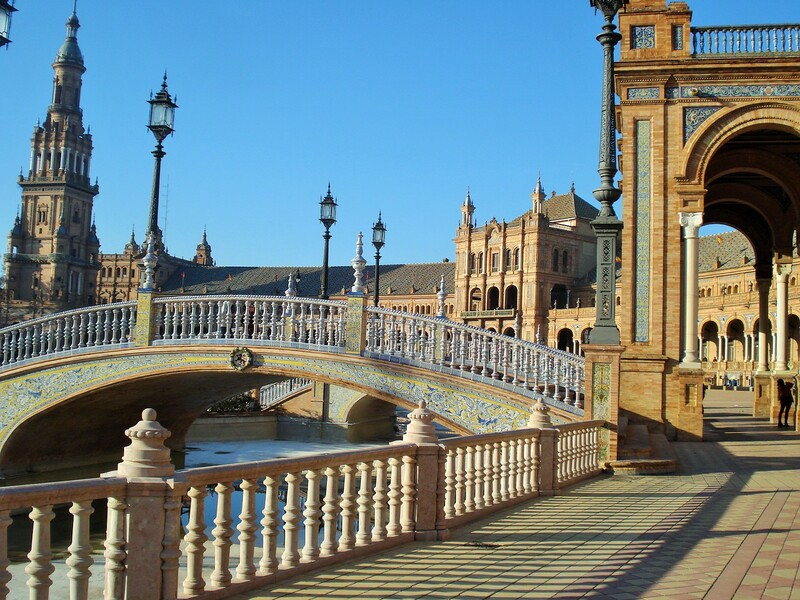 Plaza de Espana is laid out in a half moon, with the building curving around a monumental plaza with canals and tiled bridges. 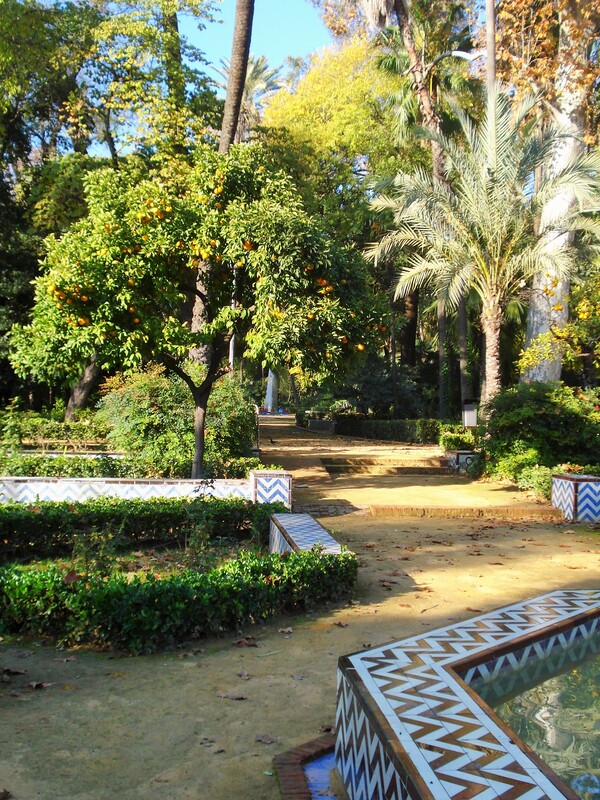 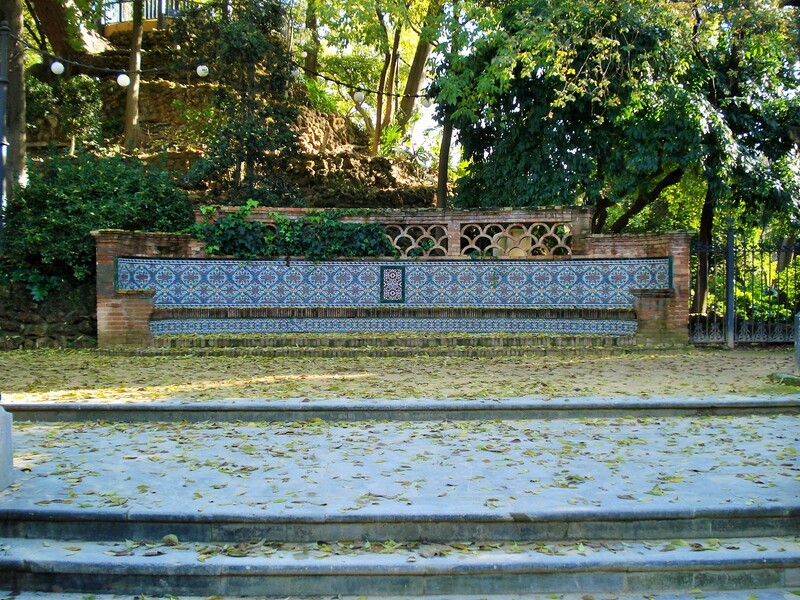 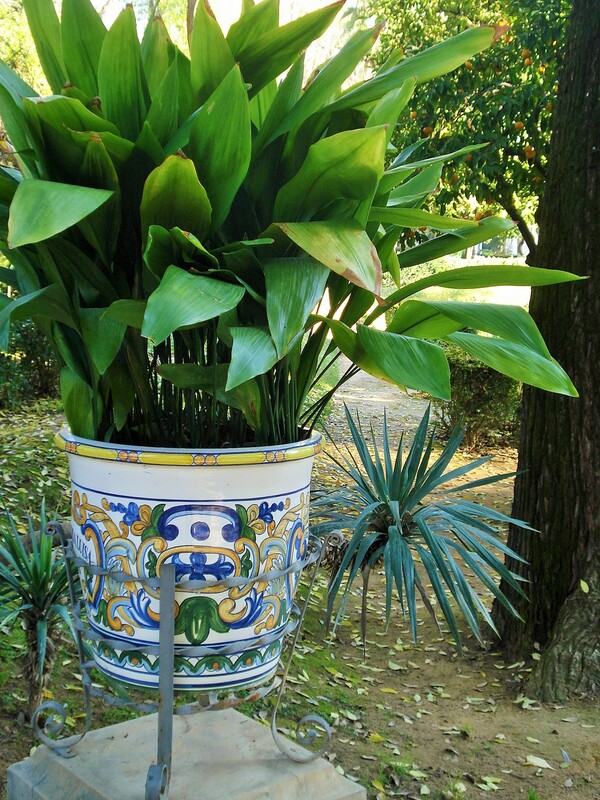 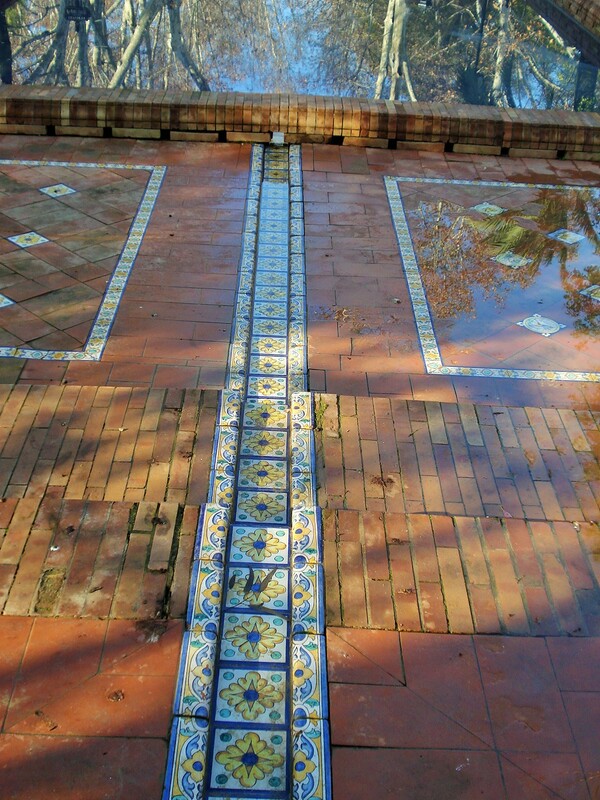 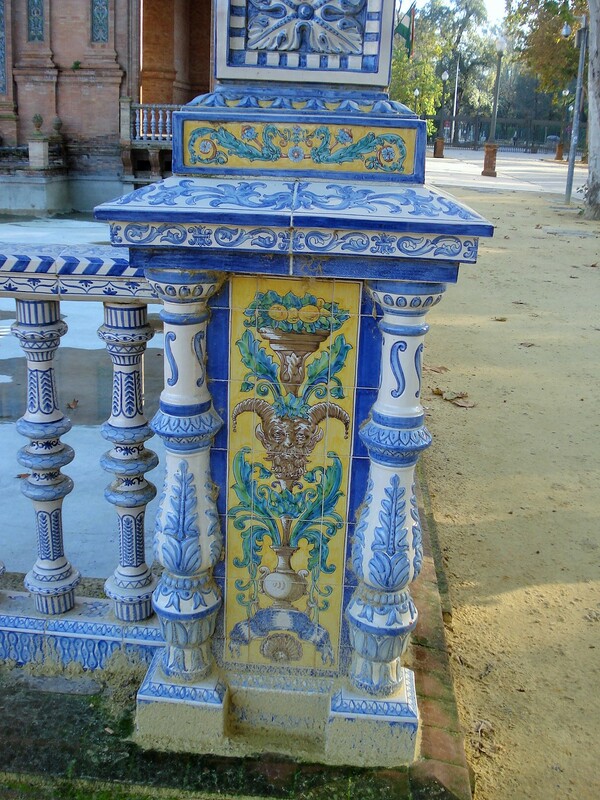 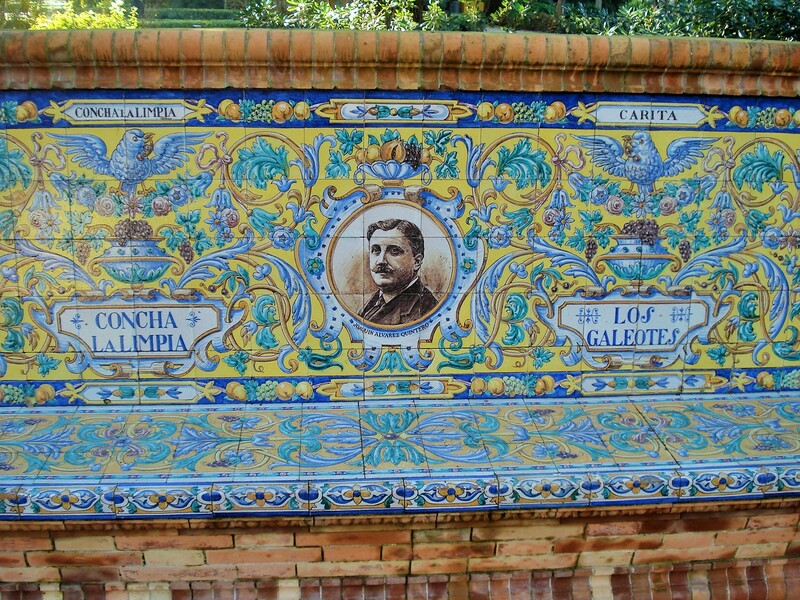 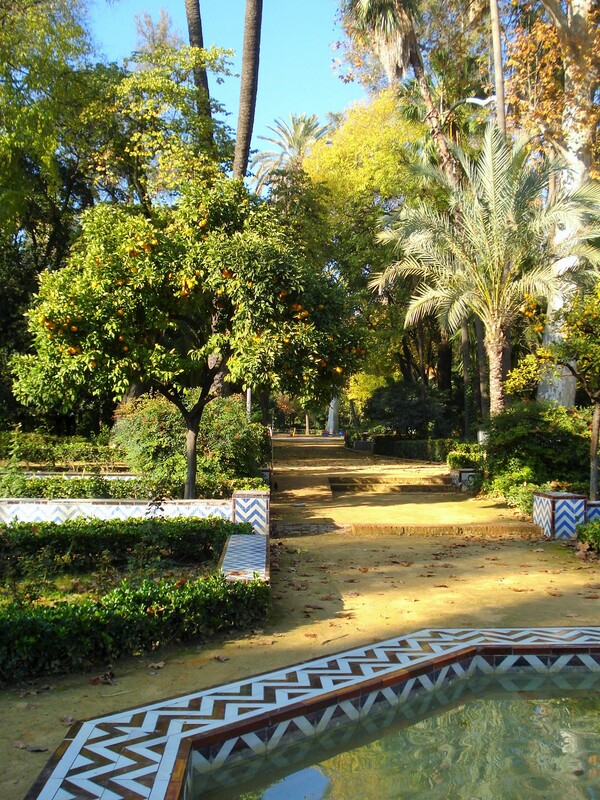 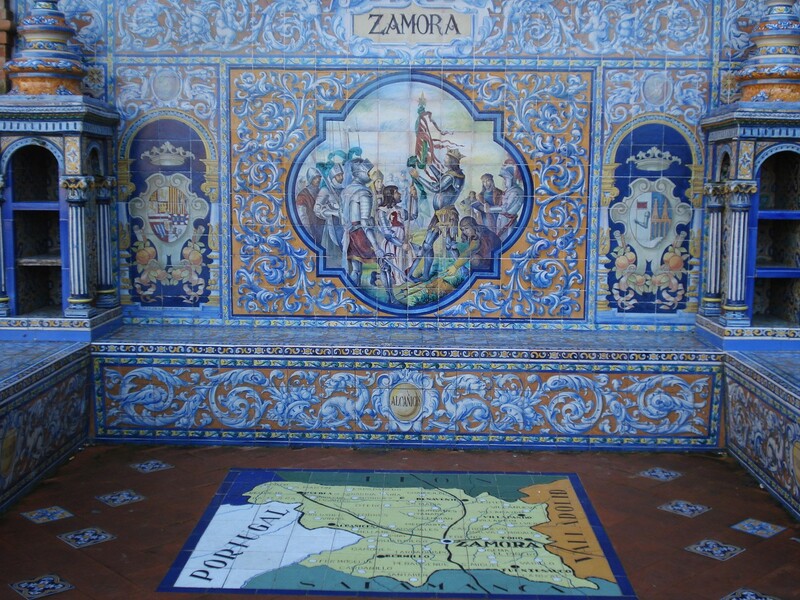 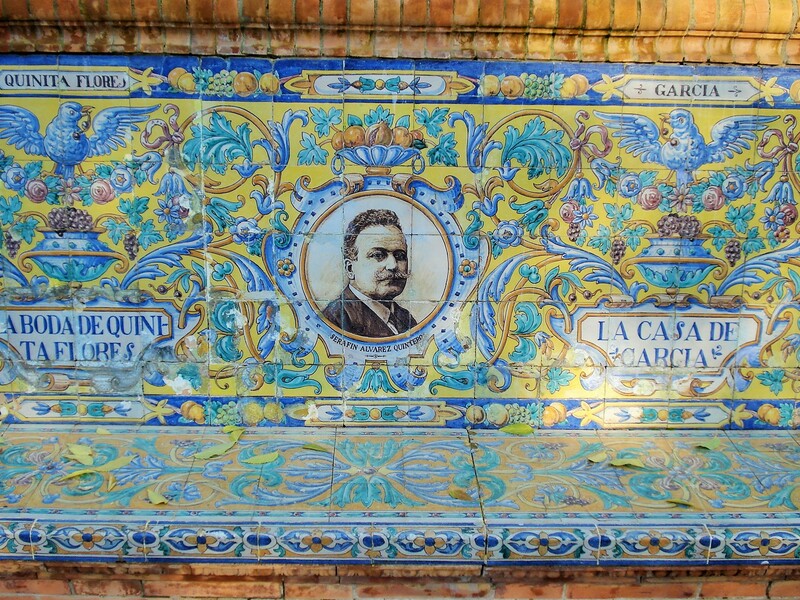 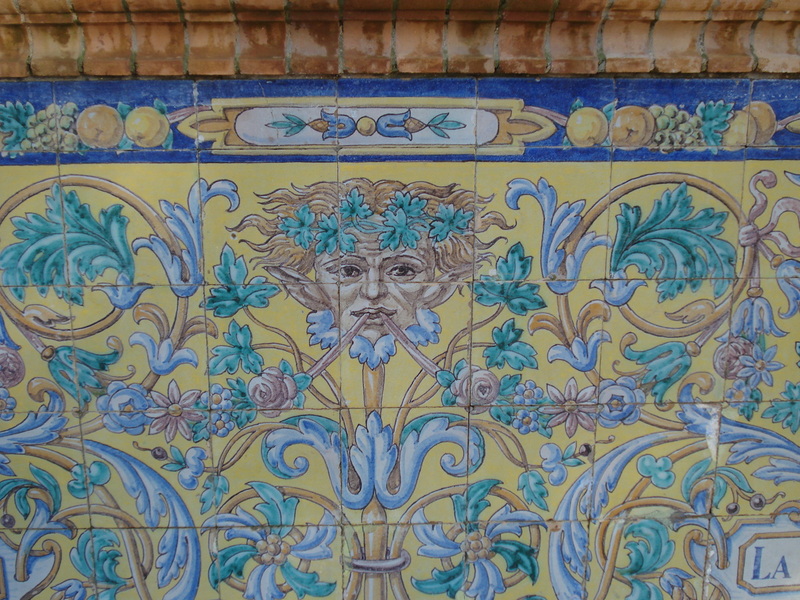 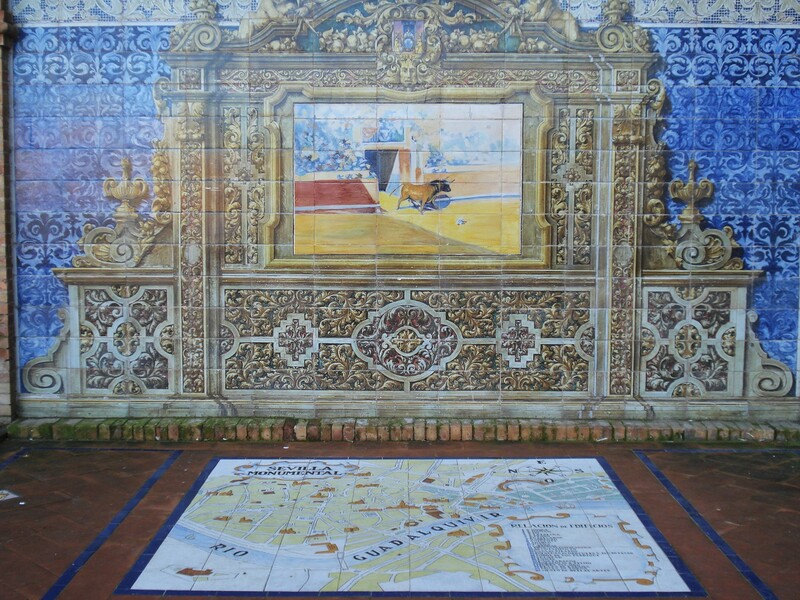 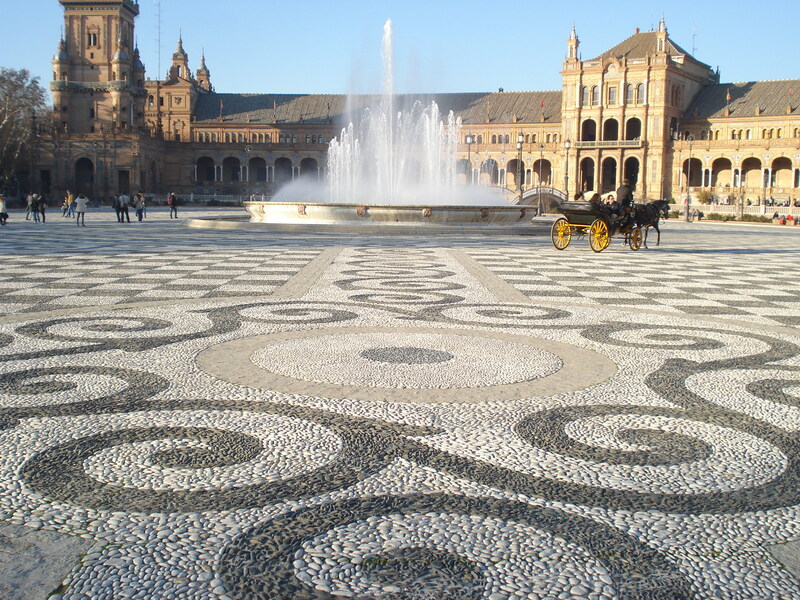 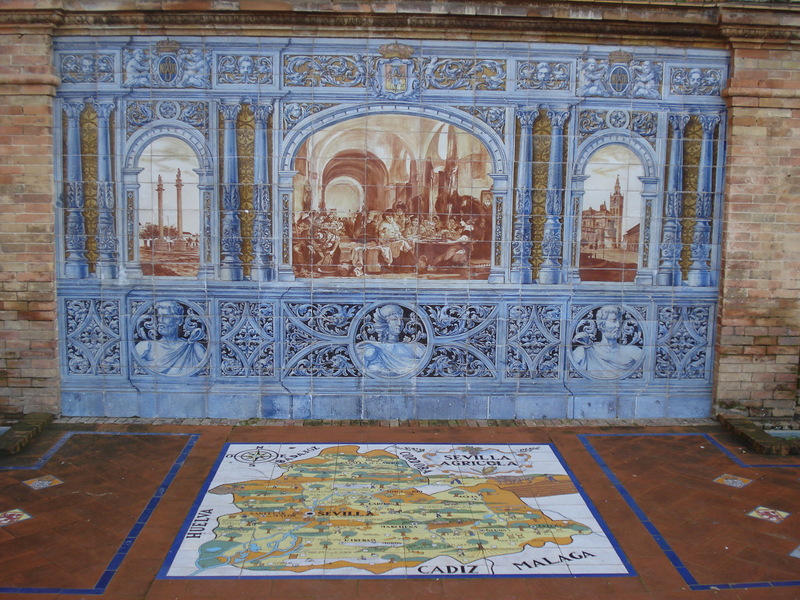 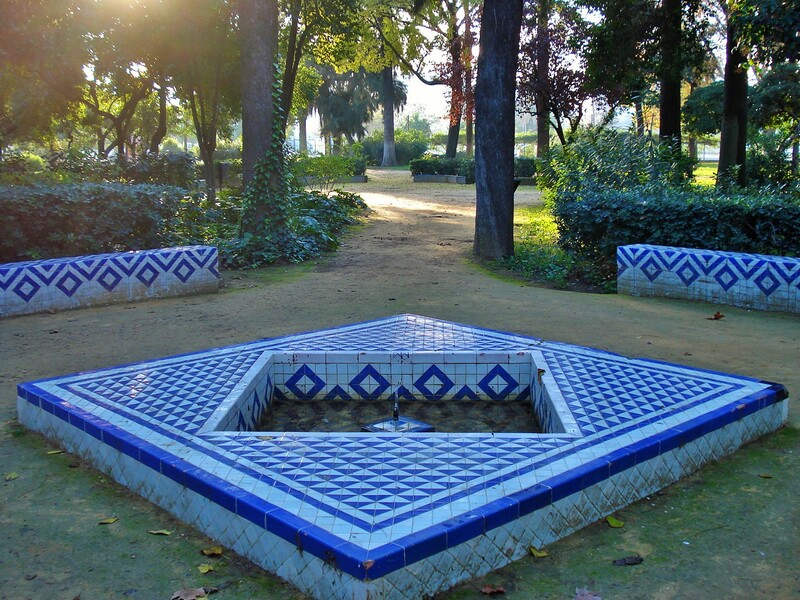 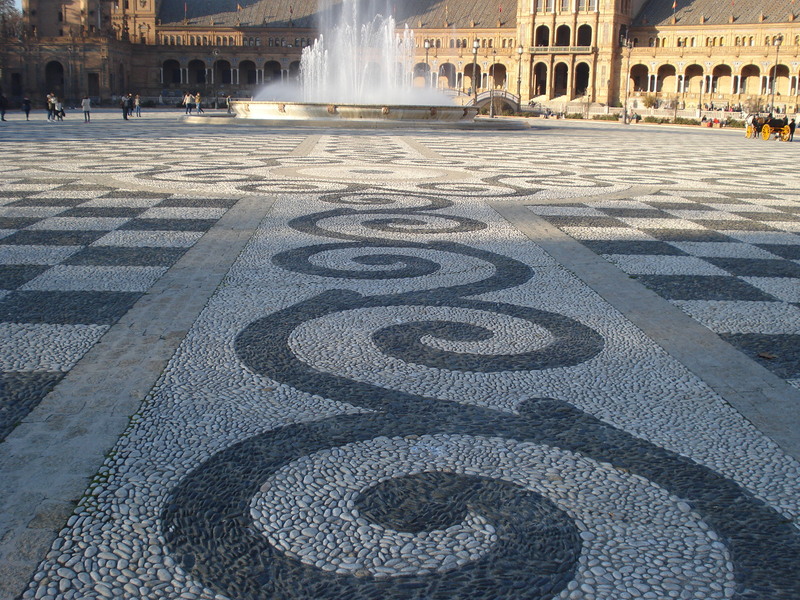 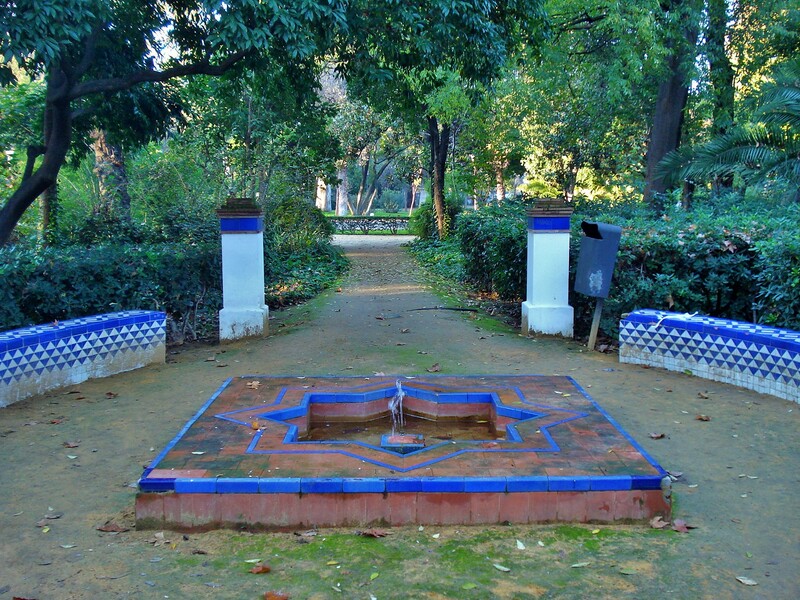 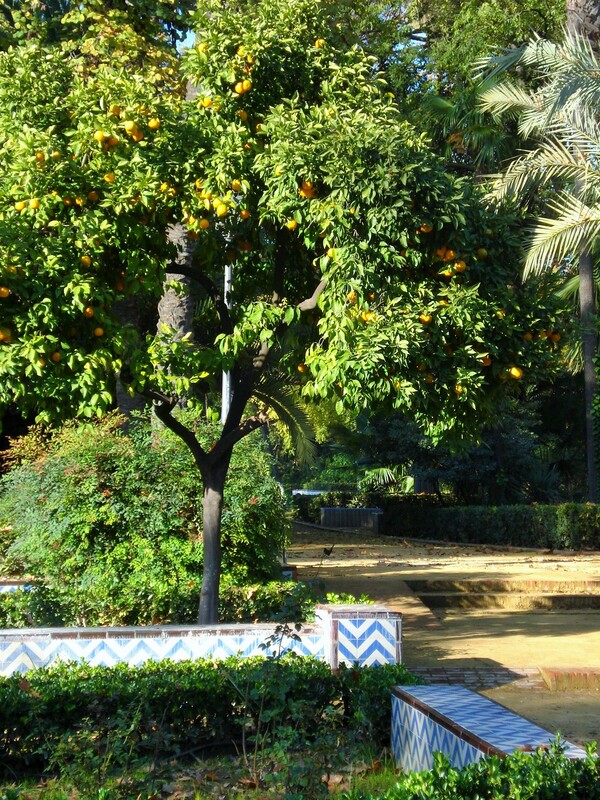 The square is tiled in the peble style so often found around Andalusian patios and squares.